It was about 7:30am when I awoke. I didn’t even need an alarm to naturally wake up at this time (must be the 4:30am wake-ups for work back in LA), but soon thereafter, Julie’s alarm went off. Neither Julie nor Tahia were in the mood to respond to this alarm so I hit the snooze button a bunch of times before Julie finally got up shortly before 8am. I kind of suspected that today would be a delayed start given that Julie was still sick and the weather forecast was pretty gloomy and wet. With time running out on breakfast, we’d finally make our way downstairs at about 9:10am. The brekkie room was quite busy, but we managed to get in our pick-me-up shortly before they were going to take the food away at 9:30am (when brekkie was supposed to end). It ultimately wouldn’t be until about 10:35am when we finally recovered our car from the valet, which followed from a lot of time that Julie spent going to a nearby convenience store to pick up some breakfast burritos (the included breakfast was neither healthy nor very good) as well as some water. We were all coughing less so far this morning, which made us wonder whether the antibiotics that we were so hesitant to take was working. 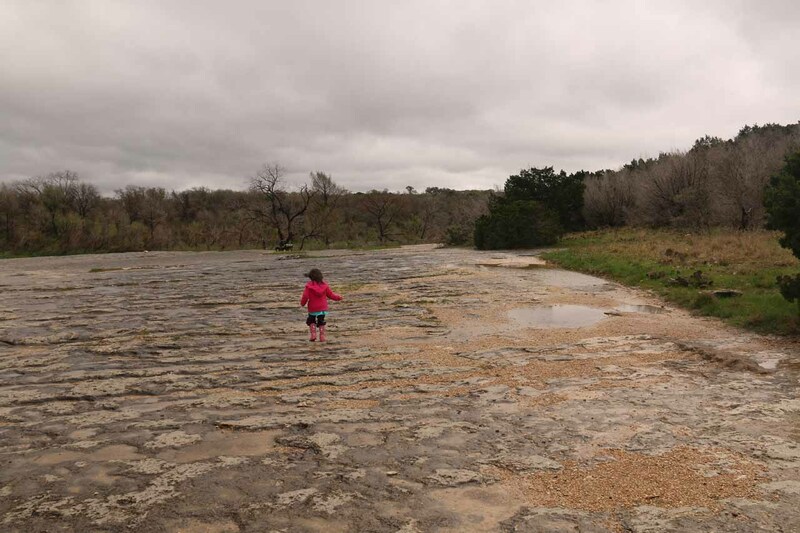 In any case, with the weather vacillating between rainy and even hints of rare sun, we finally drove off towards McKinney Falls since that was the nearest falls to Austin that I managed to dig up from our pre-trip research. I figured that we needed some momentum given the sluggish and delayed start. 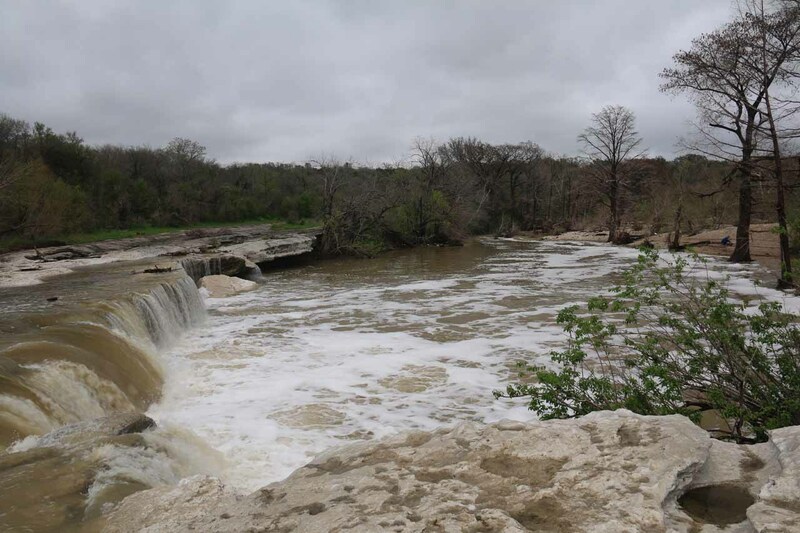 The original plan was to visit the Hamilton Pool right when they open at 9am then visit the other state parks near Austin with Pedernales Falls following McKinney Falls. 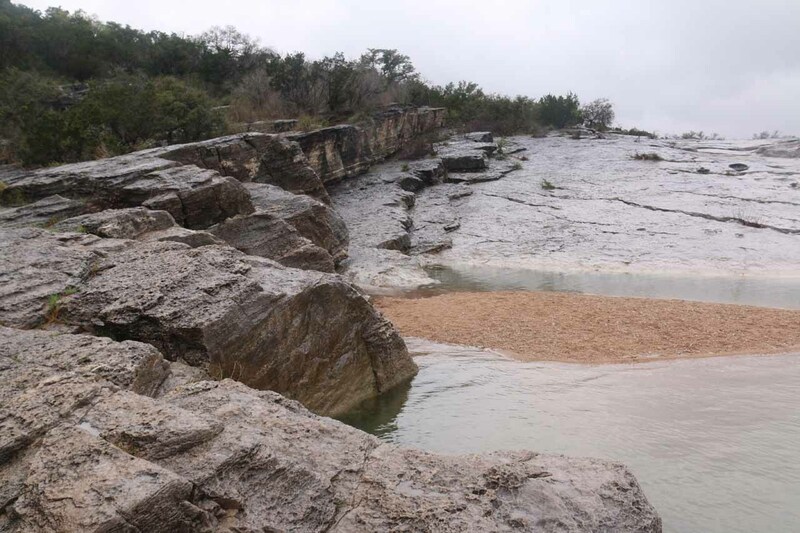 However, it was clear the original plan wasn’t going to happen, especially with the wet weather and wet forecast so we’d punt Hamilton Pool for Saturday morning when the forecast was predicting clearer weather finally. 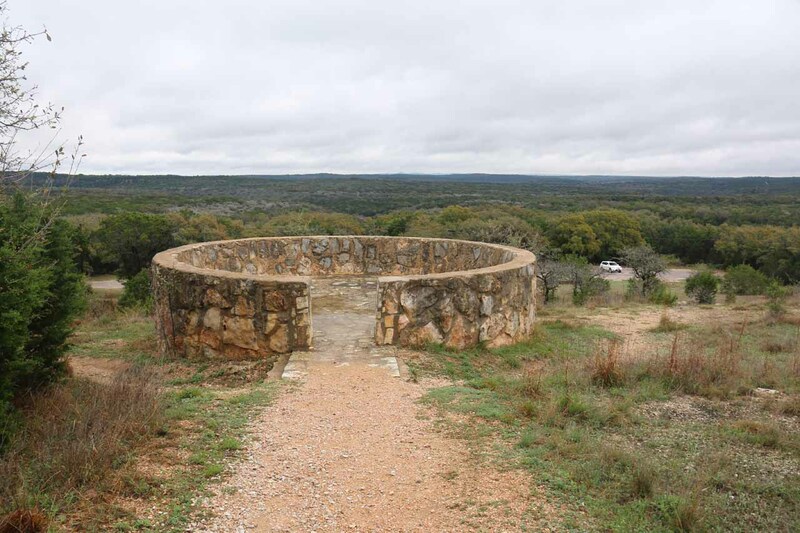 The drive was fairly uneventful as we followed the I-35W to the US 290 due east before heading south on the Hwy 183. 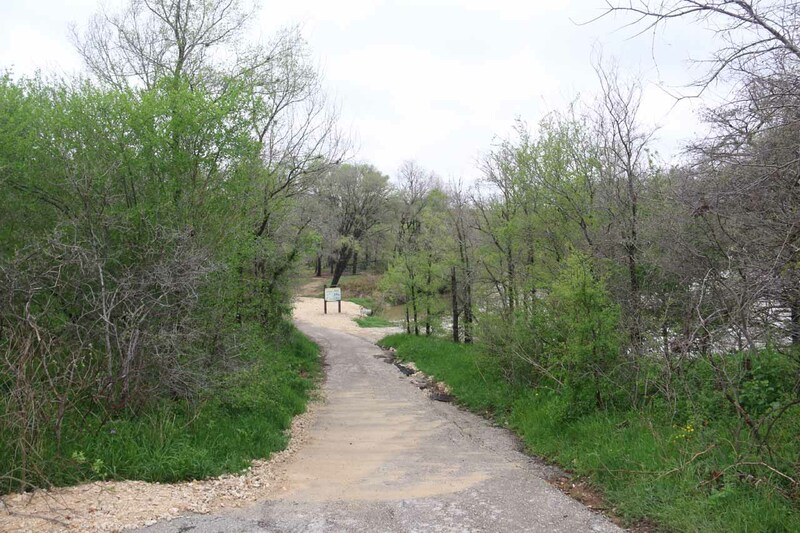 That was when we saw a brown sign for McKinney Falls State Park, where we promptly followed the signs on to McKinney Falls Parkway, which eventually led us to the state park. 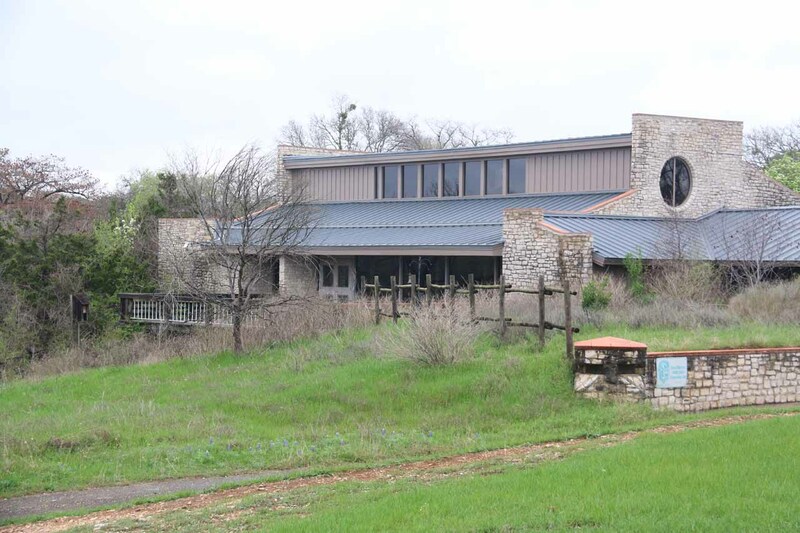 We stopped by the headquarters at 10:55am to pay our $15 dollars worth of admission ($6 per adult plus $3 for a child). 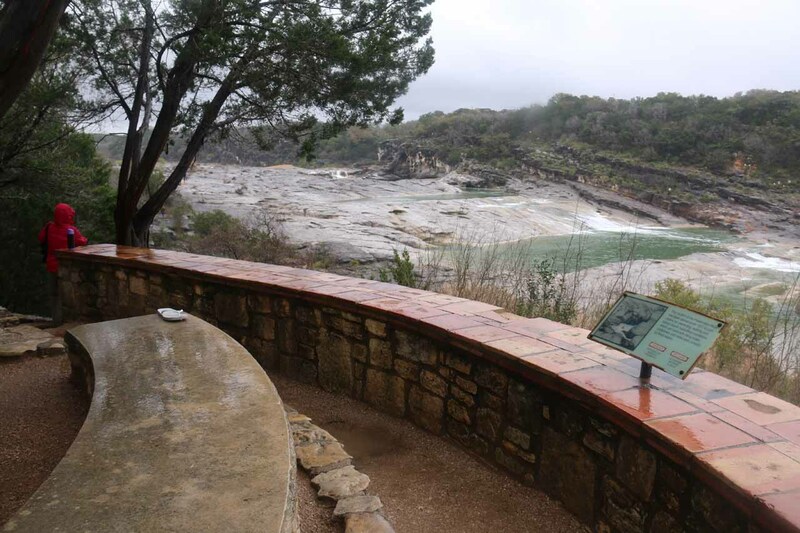 I learned from the worker there that our admission to this state park was also good for Pedernales State Park as long as we made our visit on this day. 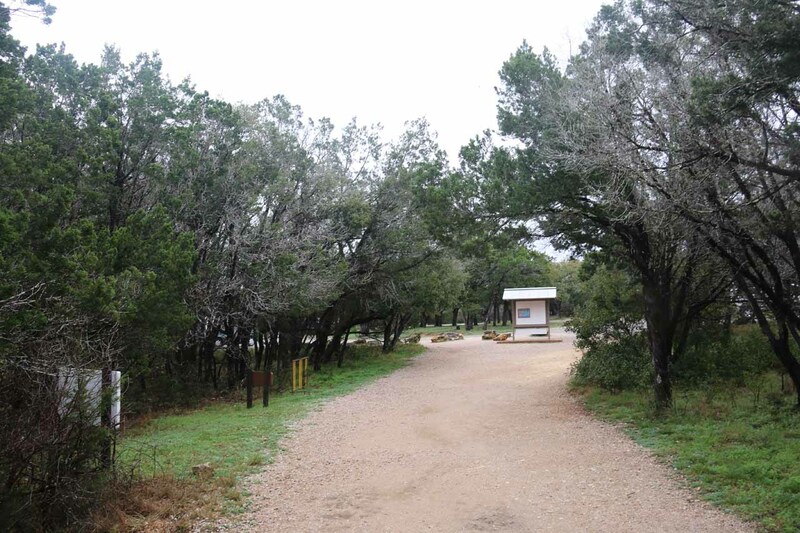 Anyways, at about 11:05am, we arrived at the trailhead for the Lower McKinney Falls. 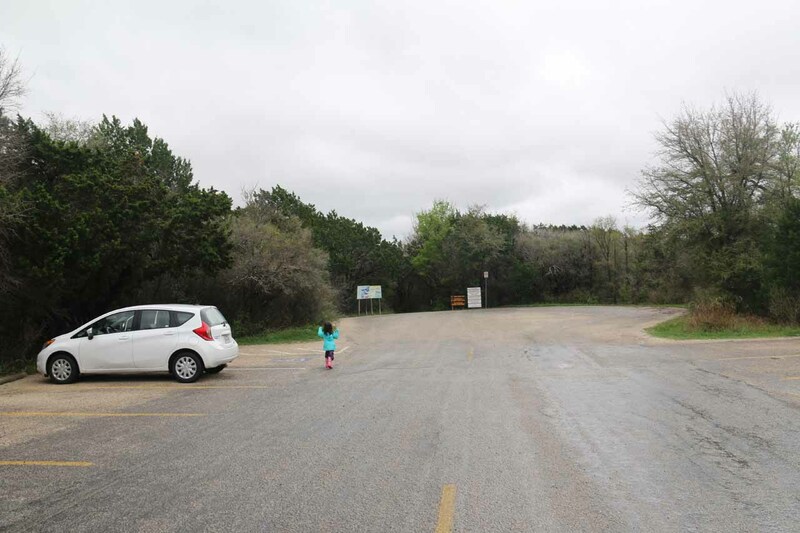 We were the first ones at this car park though there were several cars that we saw en route parked at other picnic areas and car parks. 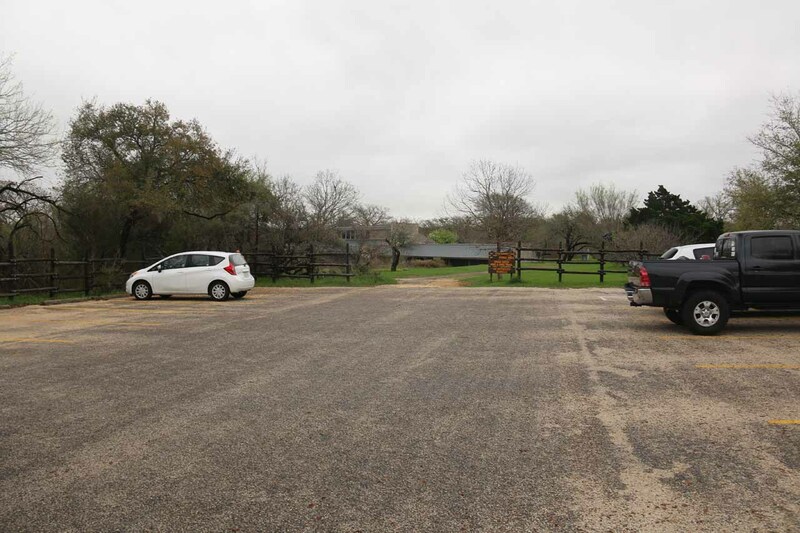 So we were by no means early at this park. 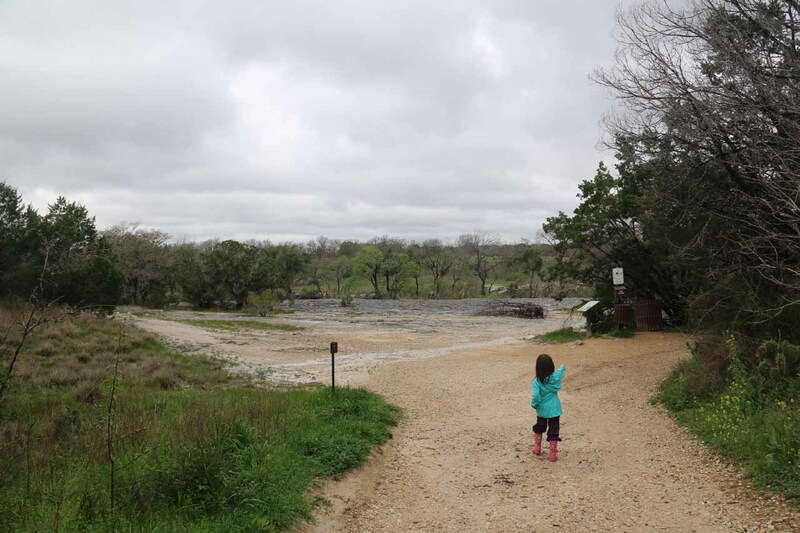 Once we got out of the car and ready for the hike, we promptly walked the descending dirt trail that was saturated with lots of water from all the rains this week. 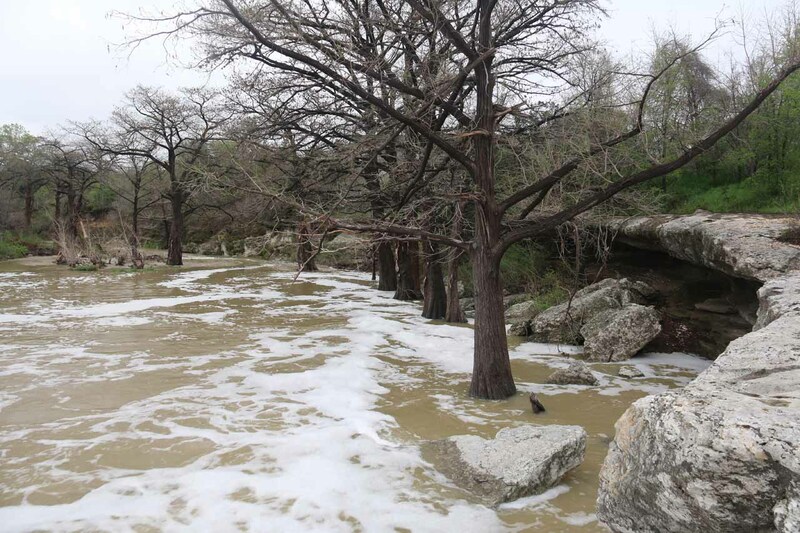 Still, it wasn’t as muddy as the Gorman Falls Trail. 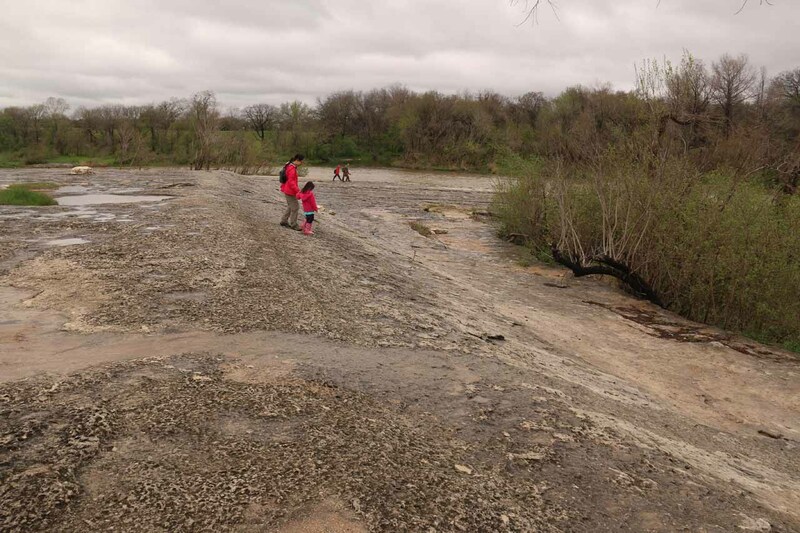 Then, it didn’t take long before the trail got to a very large rock-slab area with potholes amongst the rock slab surface filled with water. The footing there was on the slippery side, but the surface as mostly flat. Tahia was having fun trying to pretend to avoid the potholes when I knew she was mostly interested in jumping in them to create huge splashes. 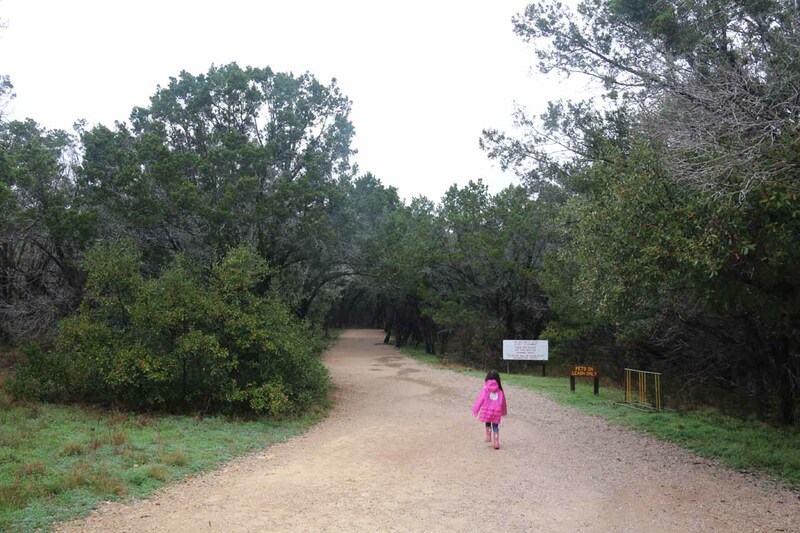 For some reason, kids just can’t resist the temptation to make splashes from puddles. 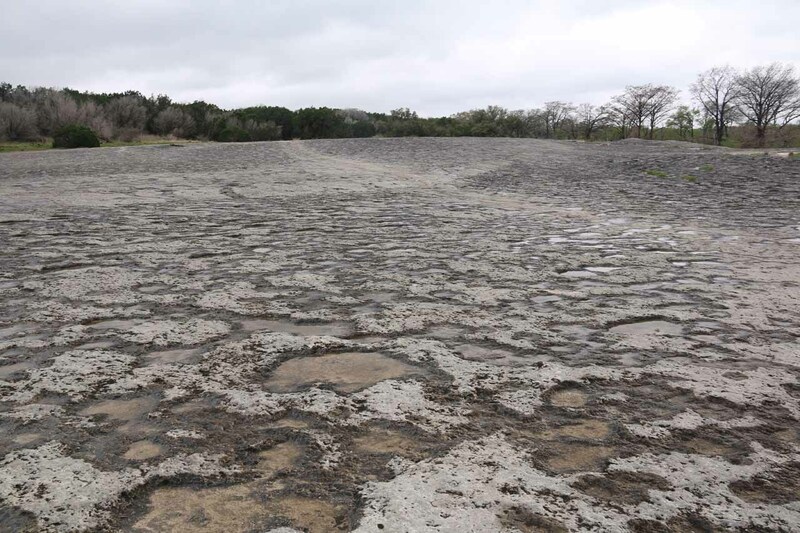 After walking across this field, we then got to a slippery decline where the rock slab slanted closer towards the Lower McKinney Falls. However, just as I was having some doubt about making it down this slope without taking a spill, Tahia and Julie were able to carefully make their descent since they had decent footwear for adequate grip. 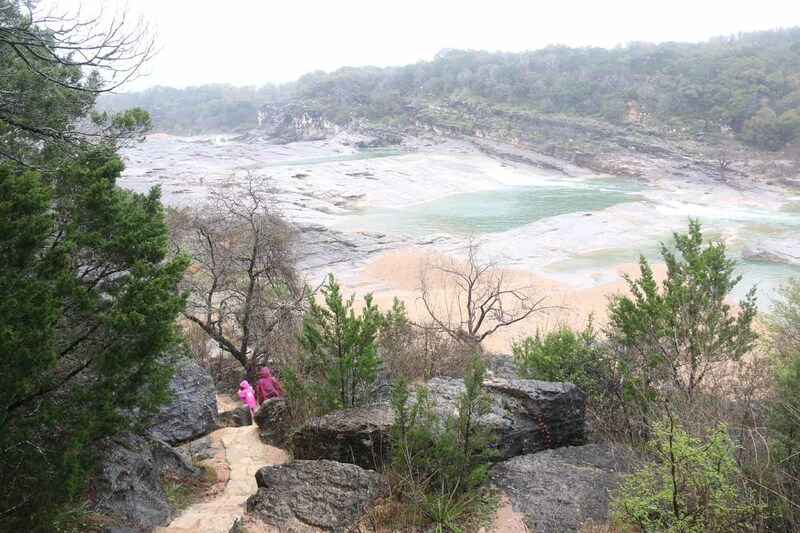 We then made the final descent towards the banks of Onion Creek below the Lower McKinney Falls. 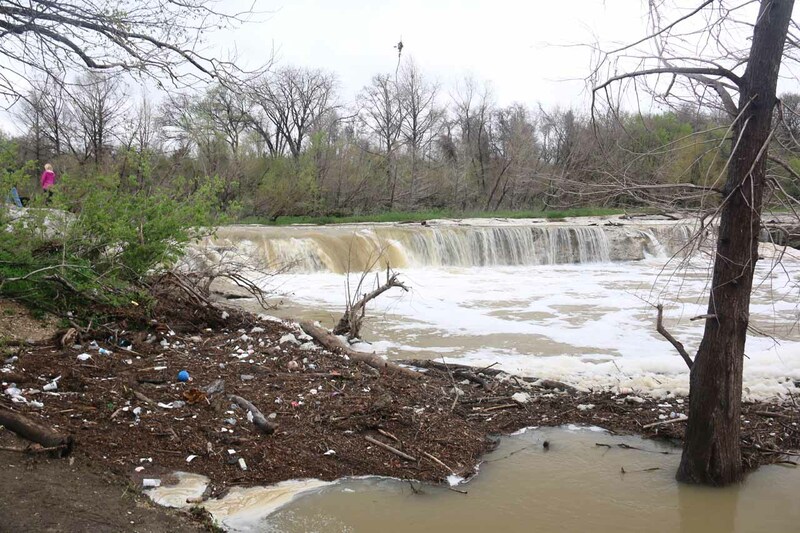 There was some unsightly litter and lots of foam in the water near the base of the falls, but it was clear that the creek was running full spate as the falls was very wide (though probably only about 15ft tall) while it appeared that the banks of the creek had flooded into some of the vegetation. 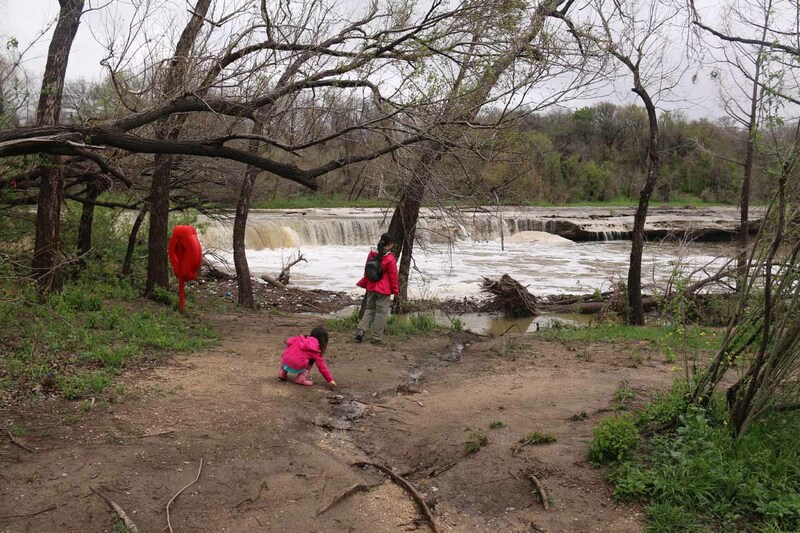 So we took our time capturing photos of the falls as well as taking some people shots. 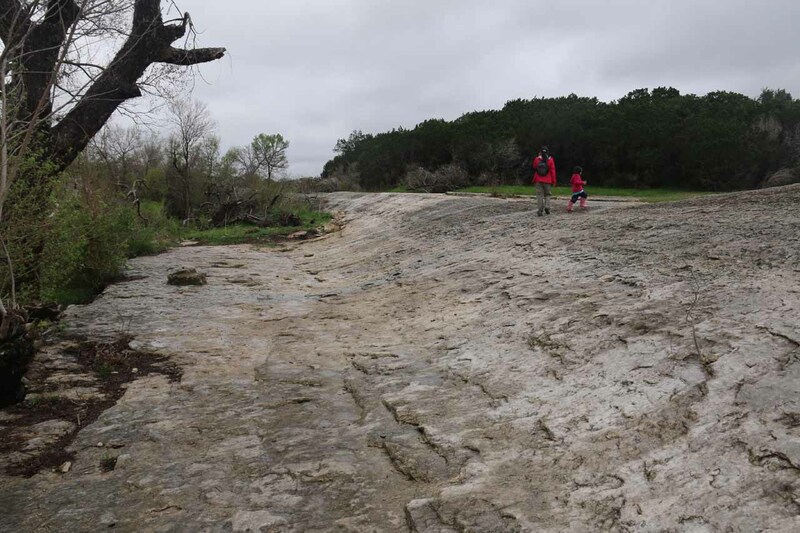 When we had our fill of this falls, both Julie and Tahia headed straight back across the rock slab field and back up to the car merely 200 yards away. 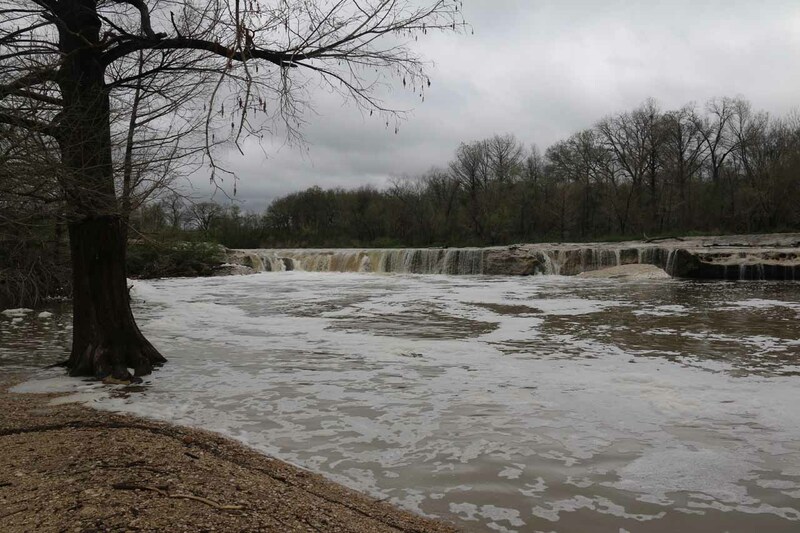 Meanwhile, I decided to explore the brink of the Lower McKinney Falls since I had seen other people up there. 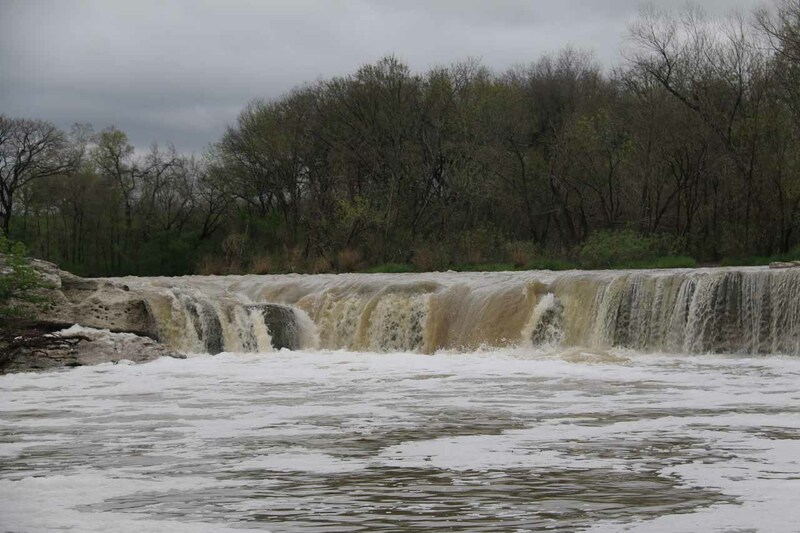 Once I was there, I was able to compose some more photos of the falls as well as some of the downstream scenery. 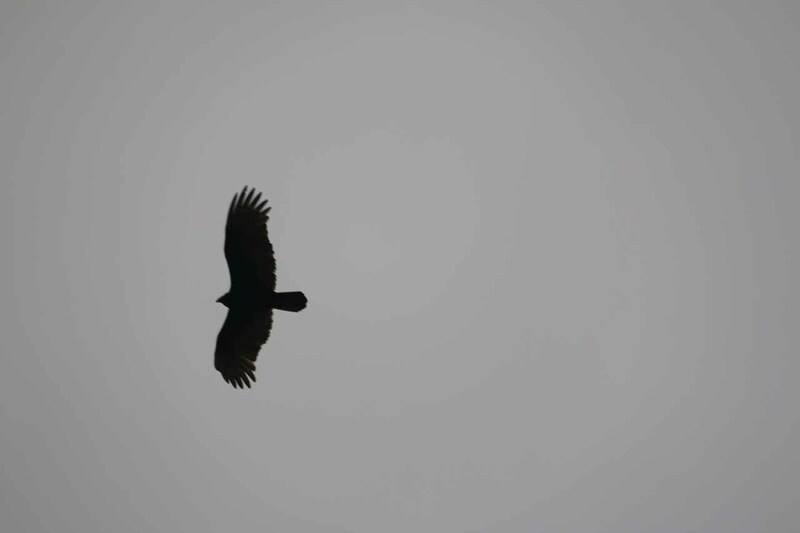 So far, the weather had held up and not dumped buckets on us as I had feared. So our visit here was pretty satisfying albeit uneventful. 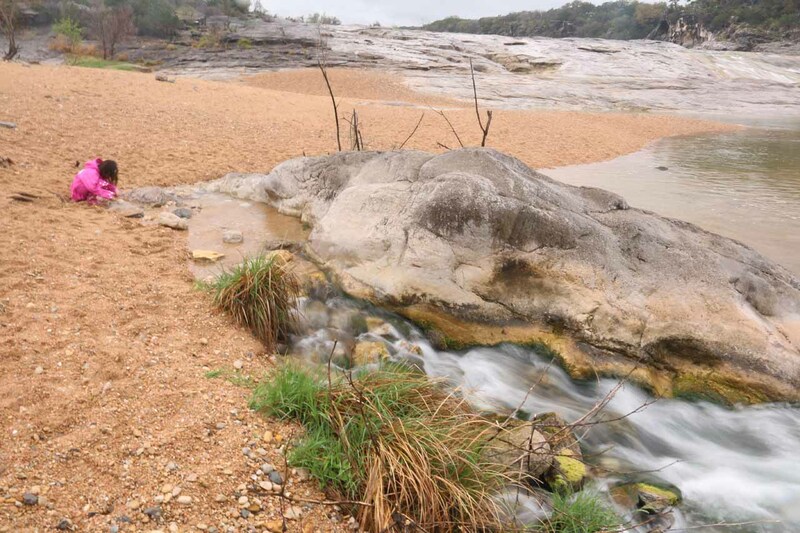 I guess if not for the dirty runoff from all the rains as well as the foam and litter, I could easily see how this place could be popular for swimming in the hotter months. 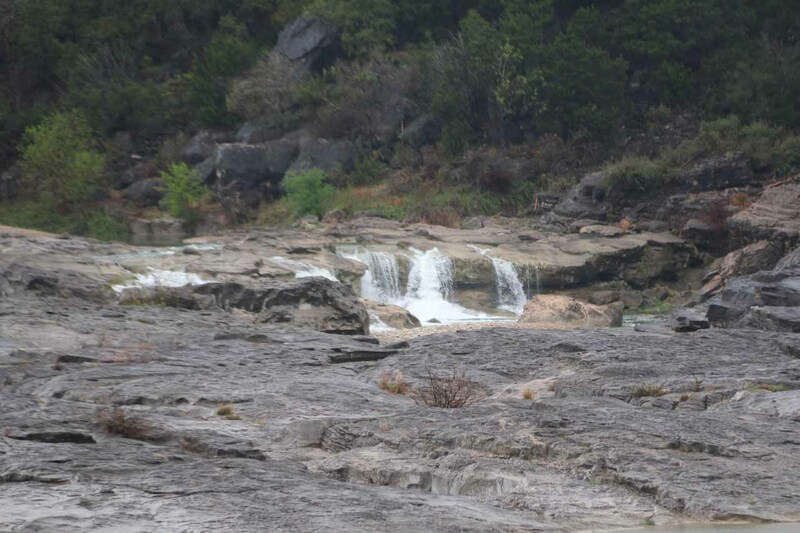 We were back at the car at 11:40am, and instead of hiking the picnic trail all the way upstream to the Upper McKinney Falls, we drove to the nearest car park for the Upper McKinney Falls. We got there at about 11:50am, where there was also the Smith’s Visitor Center. It didn’t look open however. 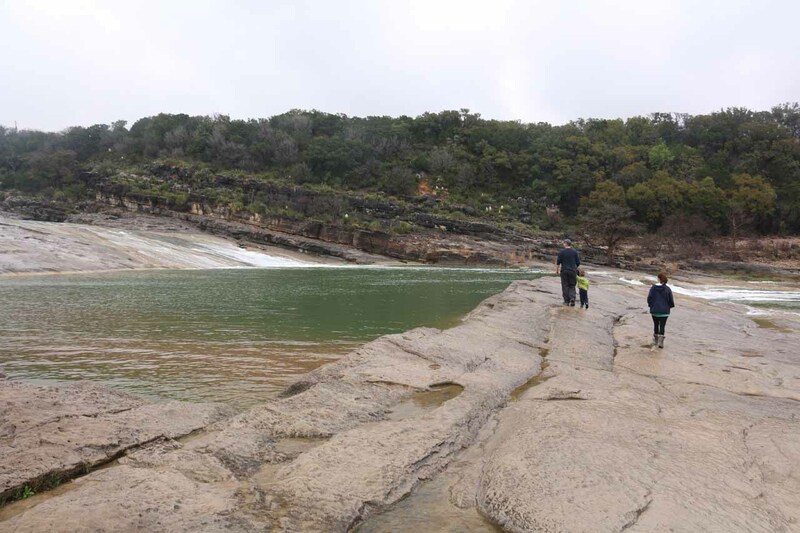 And shortly after that, we made the even shorter descent towards the brink of the Upper McKinney Falls, which was nowhere near as scenic as the Lower McKinney Falls. 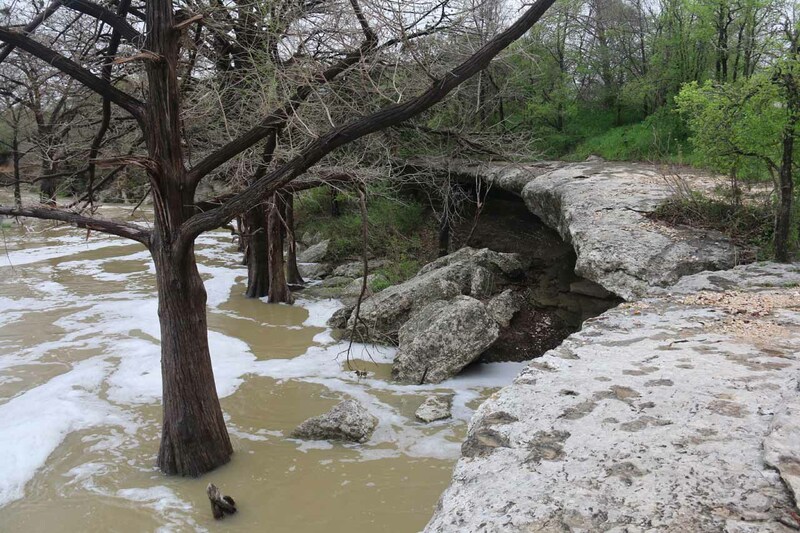 This was really more of a funneling of Onion Creek towards a small plunge while surrounded by more of the rock slabs that appeared to be a very common feature of this place. 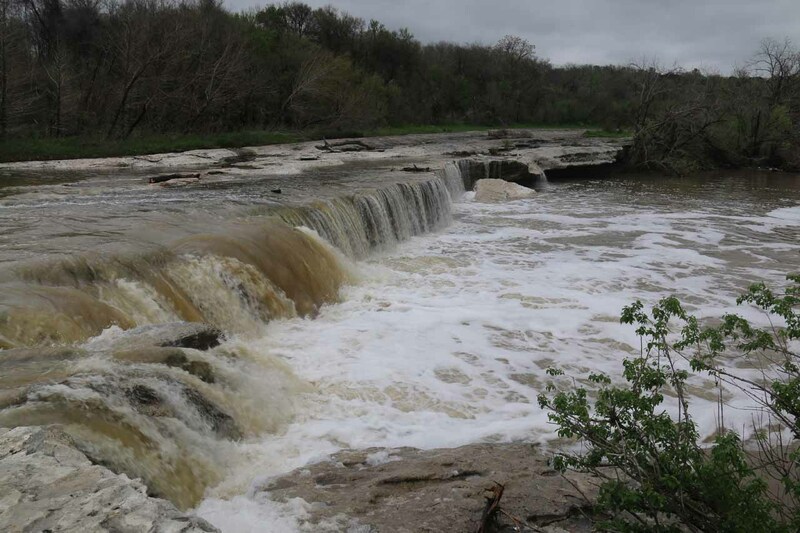 Nevertheless, the puny size of this falls made me glad that I didn’t hike to picnic trail between the lower waterfall and this waterfall, which I had contemplated doing earlier. Down below on the right side of the plunge pool of the upper falls, we saw that there was an intriguing overhanging area, but it didn’t look accessible. 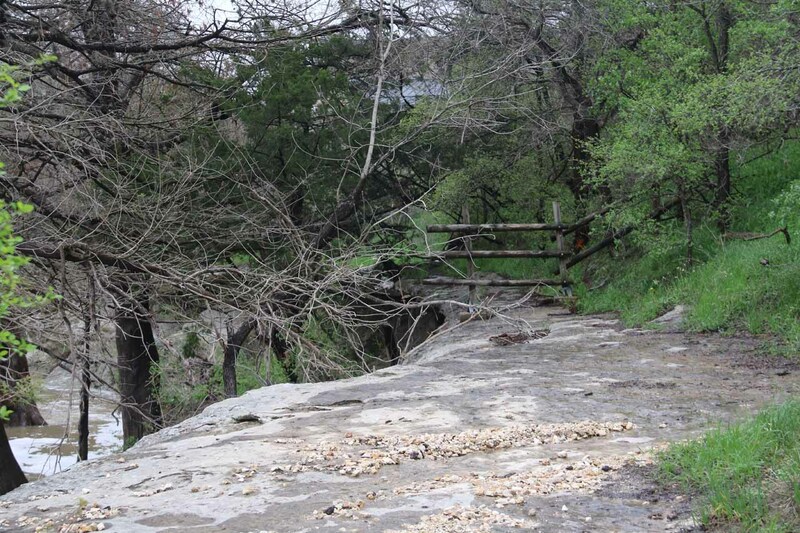 They also fenced off the top preventing people from walking on the overhang for fear of it collapsing. 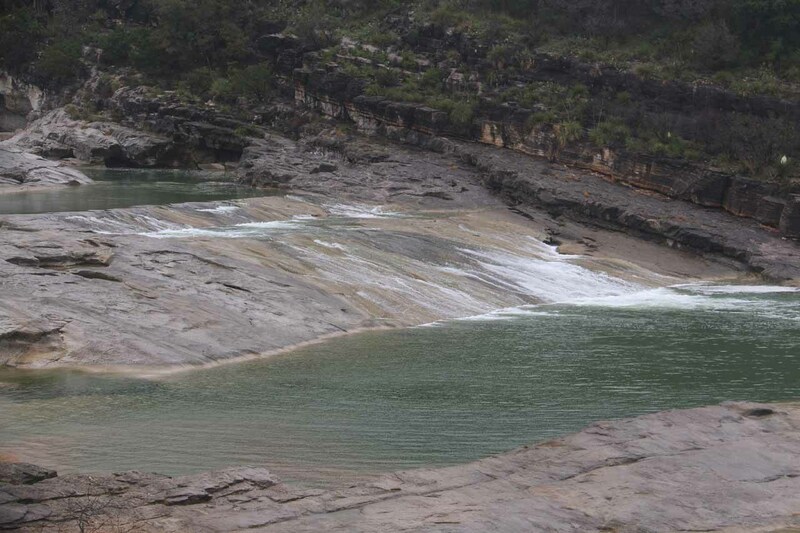 And there were sheer dropoffs plunging right into the water below on the slab that we were standing on in the near side of the overhang as well as on the far side of the overhang in the distance. 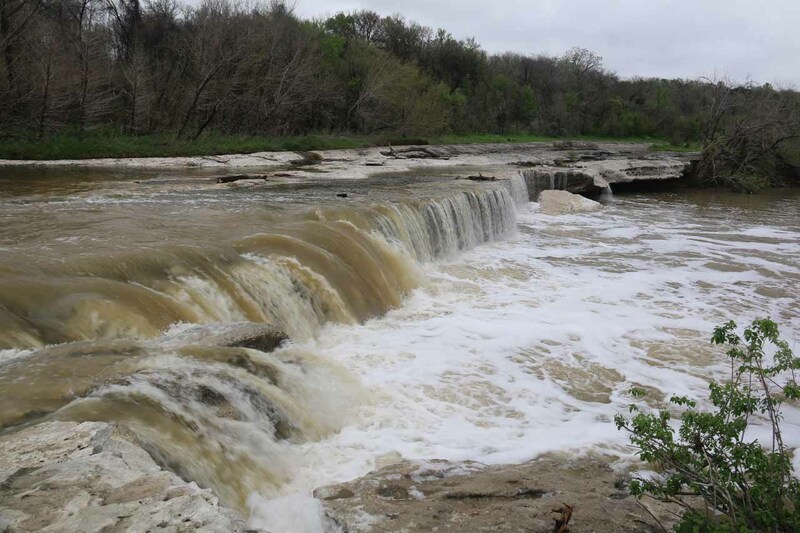 So we just had to be content with this tiny falls and just gawk at whatever else caught our attention. At 12:05pm, we made it back to the car. 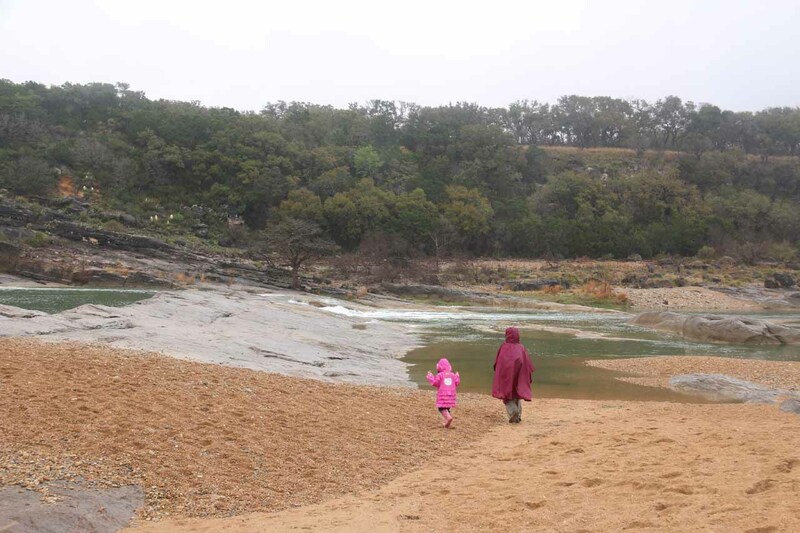 Again, the weather had held up, but as we were leaving McKinney Falls State Park at 12:15pm, we were starting to see more drizzle, which then turned to rain. 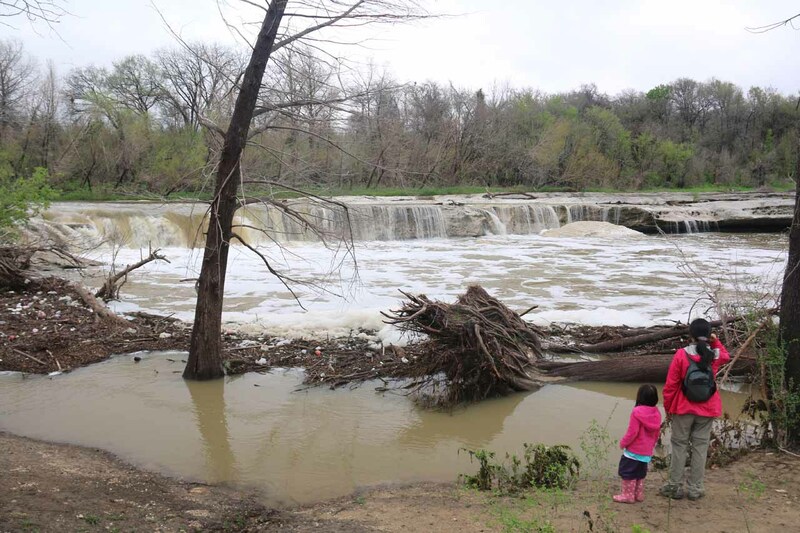 I knew the relatively calm weather wasn’t going to hold up given how the weather had been this week. But even with the yucky conditions, I guess we can’t totally complain given how Louisiana was getting the brunt of this low pressure system that was bringing moisture up from the Gulf of Mexico. 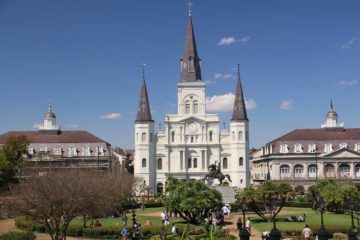 We even saw footage on TV last night of Bossier City getting major flooding, and that was where we were going to go on Tuesday (after visiting New Orleans from Saturday to Tuesday). 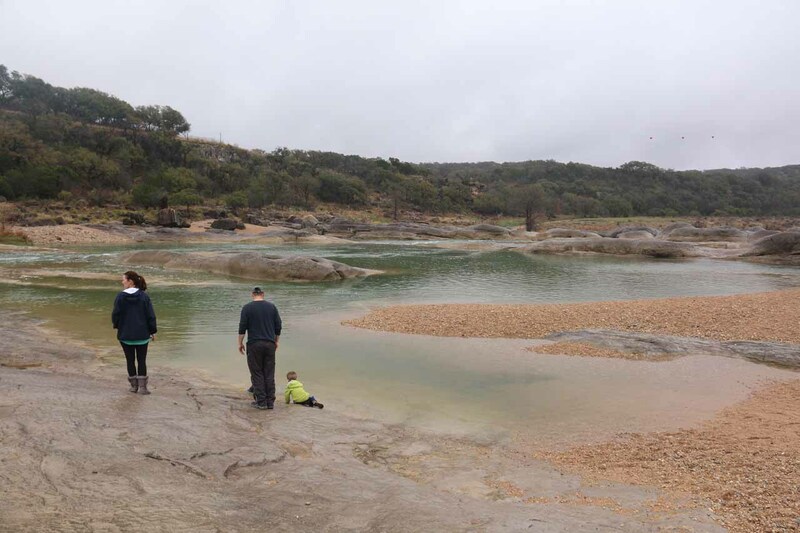 Next up was Pedernales State Park. This time, we followed the GPS though the Nuvi was working on an outdated map while Julie’s iPhone seemed to have the more correct directions. 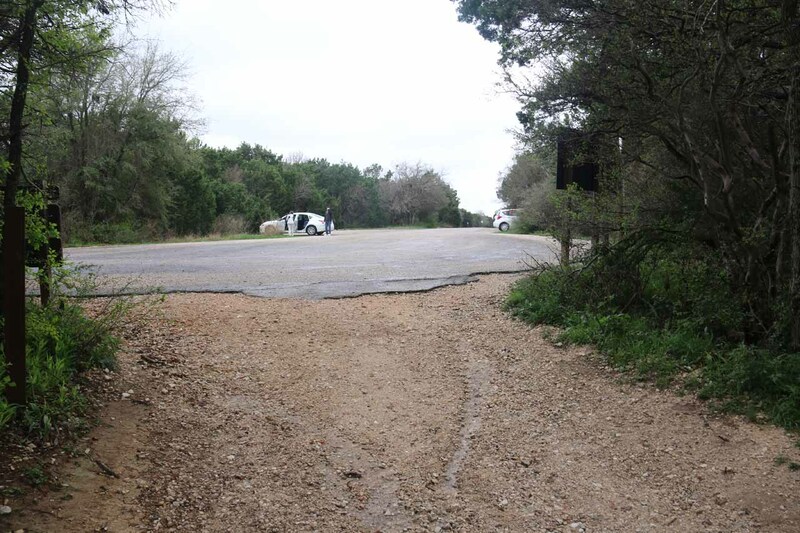 Julie’s iPhone had us driving on Burleson Rd as we were leaving McKinney State Park towards the Hwy 290 (instead of backtracking the way we came in). 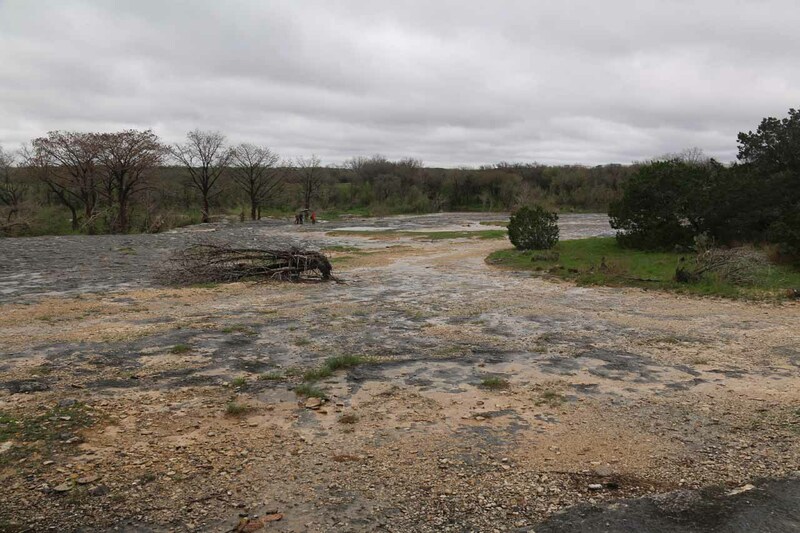 Once we were on the Hwy 290, we then followed this highway (starting off as a freeway before becoming a high speed country road as we left the Austin city limits to the west) into some more rainy weather. 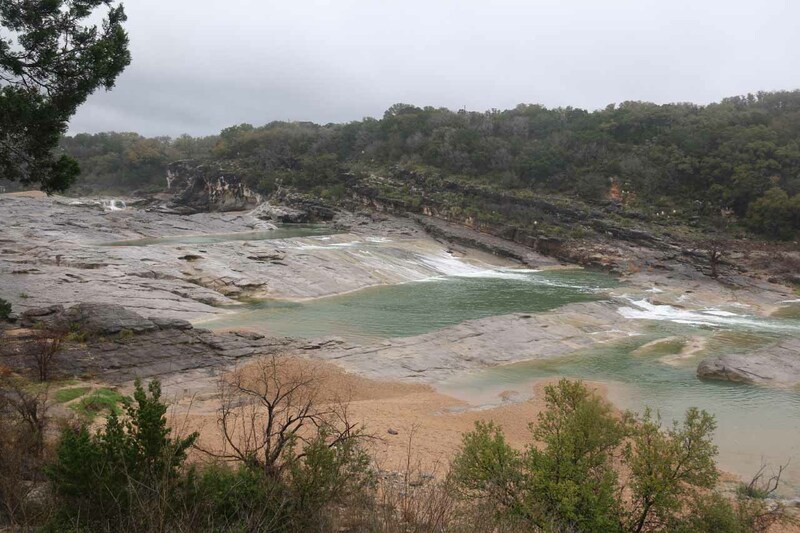 We would follow Hwy 290 until we saw a brown sign for Pedernales State Park, which followed the local road 3232. 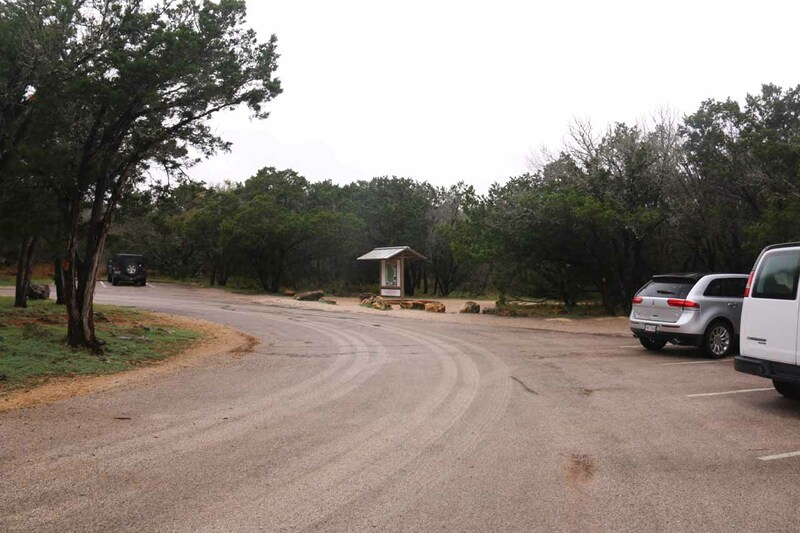 Eventually by about 1:25pm, we showed up to the park headquarters for Pedernales State Park, which I went in to grab a trail map thinking we might need to do a little hiking for this one. 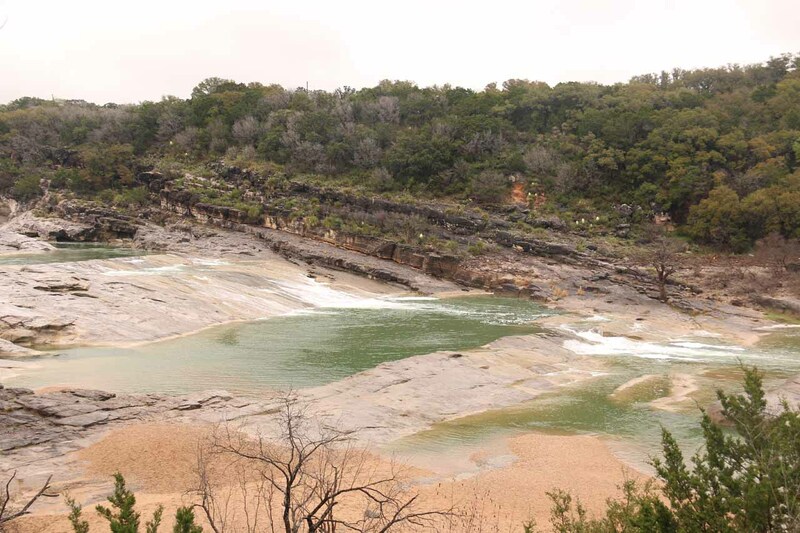 Then, we eventually made it to the car park for Pedernales Falls at about 1:30pm. It was still raining lightly and we thought we needed to don our rain ponchos and waterproof pants. 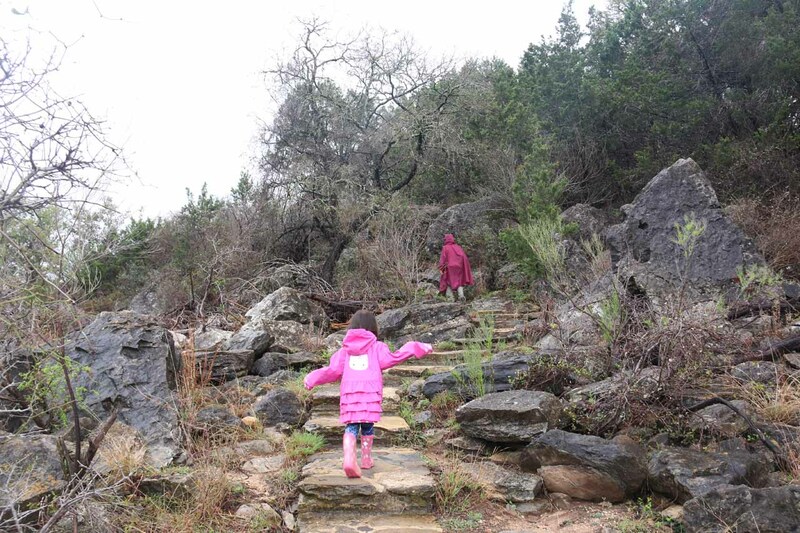 But as we were walking the short trail that got us to the overlook of the Pedernales Falls, it seemed like these things weren’t totally necessary. In fact, my waterproof pants weren’t very breathable so I was actually getting wet from perspiration as opposed to getting wet from the rain! 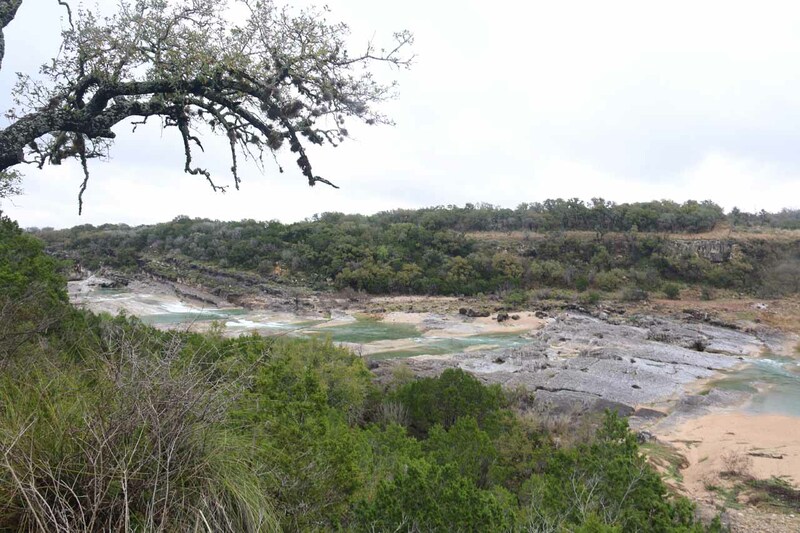 Anyways, we could see from the overlook that Pedernales Falls was really a series of waterslides over probably a series of 3 or 4 obvious tiers. 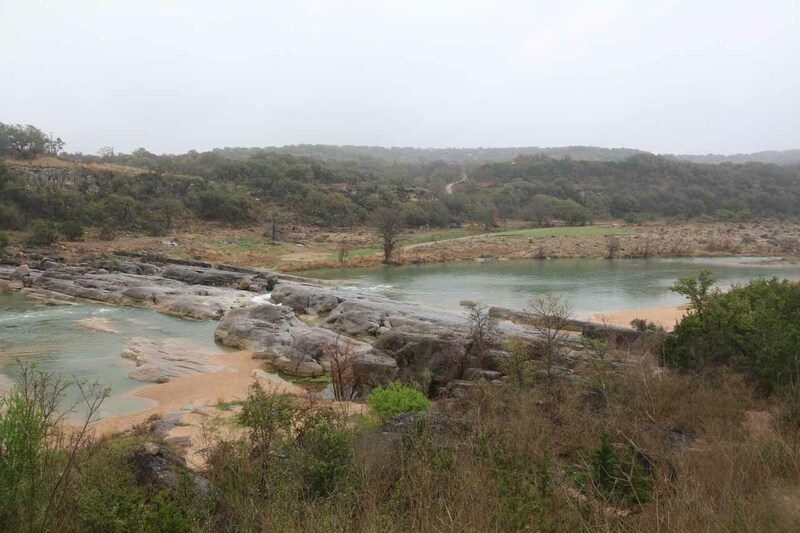 Once again, we could totally see why this place would be popular for swimming in the hotter months, but on a day like today, one would be nuts to be swimming in the Pedernales River given all the storm runoff. 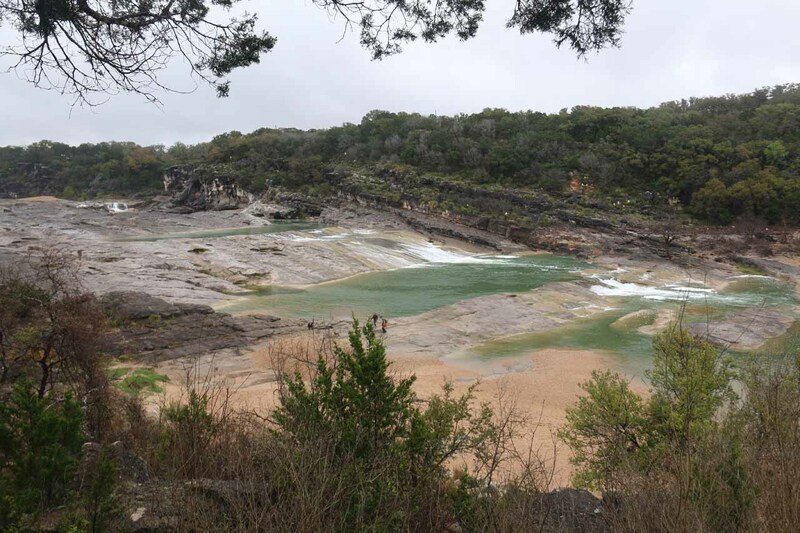 As we saw there were people chilling out by some of the pools beneath each of the waterslides of Pedernales Falls, we decided ourselves to continue down some stone steps right down the left side of the overlook towards the banks of the Pedernales River. We eventually made it up towards a rock slab jutting towards the main waterslide’s plunge pool, where we took a few more photos while Tahia was busy chucking rocks into that plunge pool. 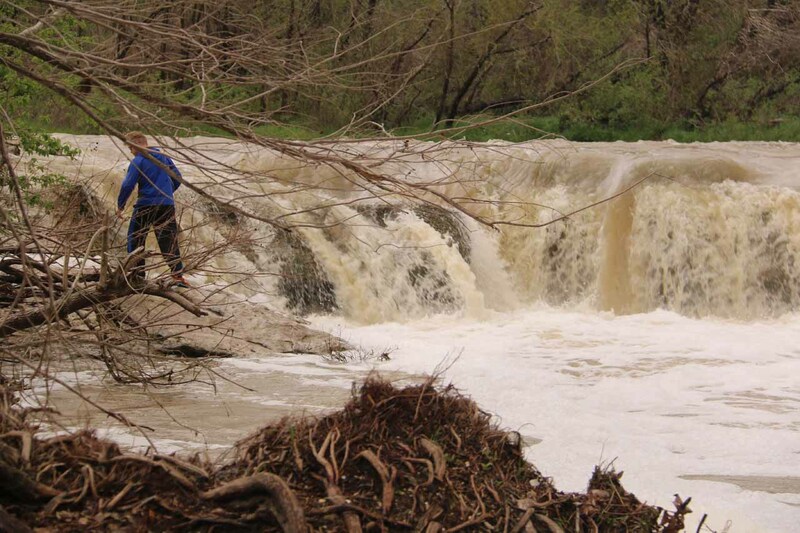 Next, we made our way downstream just to see if there were other ways to experience this waterfall. 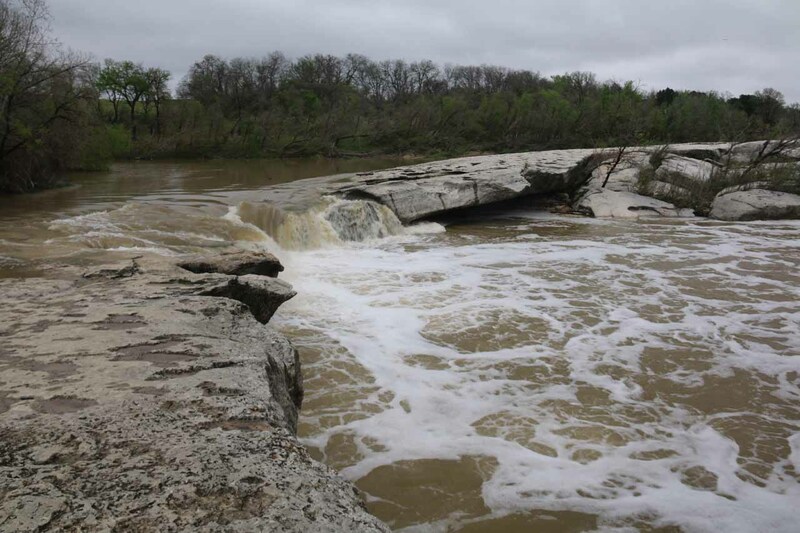 And that was when we noticed that there was a split cascade (maybe only 5ft or so) spilling into the Pedernales River. 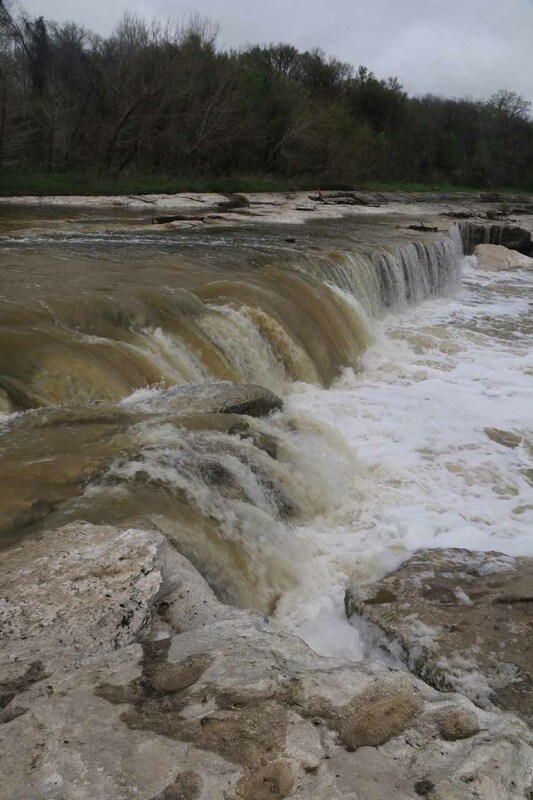 But what was interesting about this little cascade was that it seemed like it was completely fed by a spring! 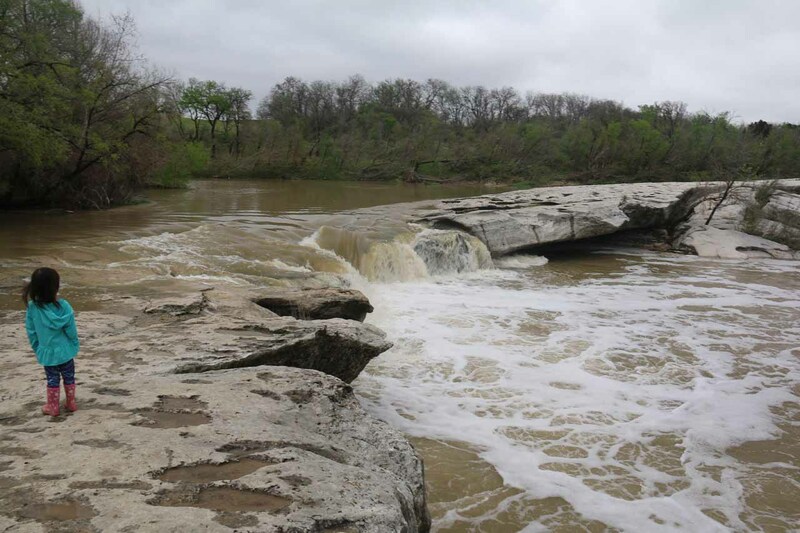 Indeed, it looked like there wasn’t a sourcing creek going to these cascades, and instead, we saw water bubbling up from the sandy bottom creating enough volume before splitting up and cascading around a large slab of rock. Tahia was having fun with this spring as she had it in her mind to try to manually plug up the source of the bubbles. 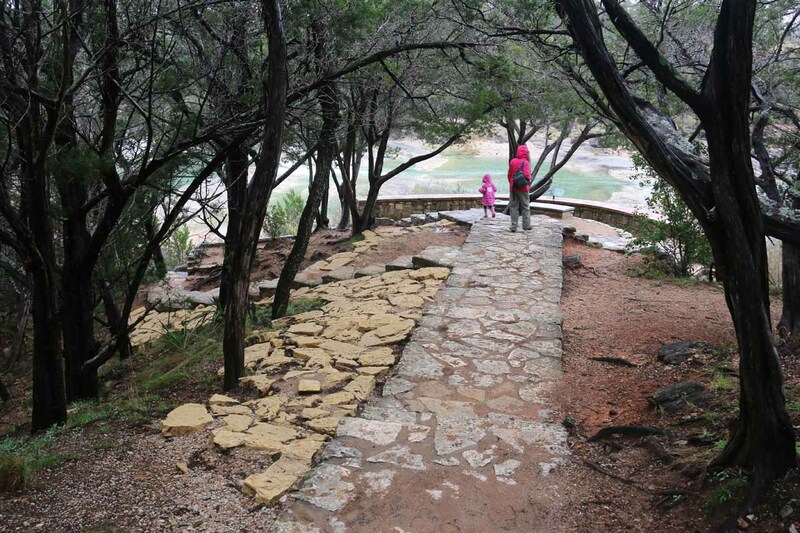 Anyways, once we had our fill of this little surprise, Julie and Tahia made their way back up to the car park. 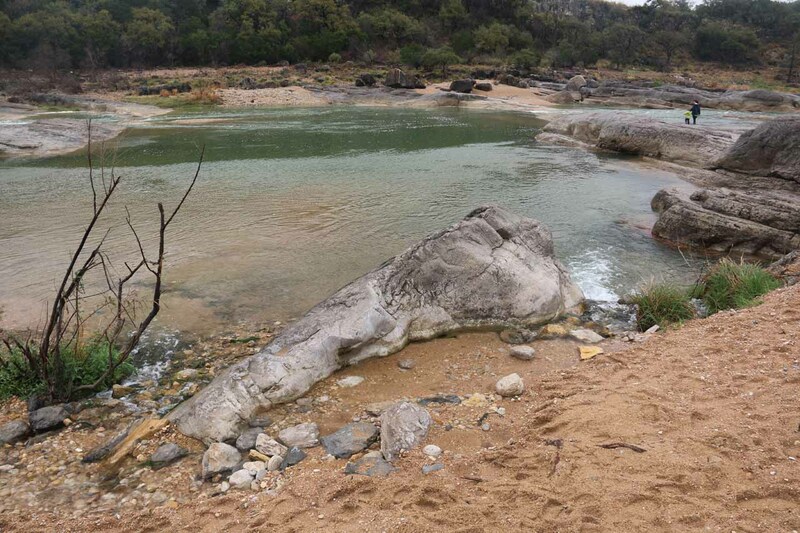 Meanwhile, I did a little more exploring on the other side of the lookout, which apparently led down to the so-called Cypress Pool, which I think was perhaps THE spot for a swim as it was at the very bottom of the cascade series of Pedernales Falls. 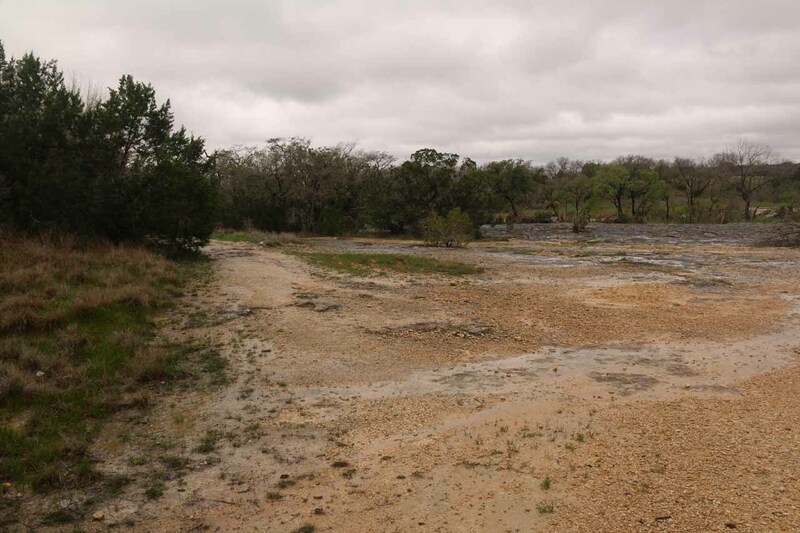 There was also a fairly sandy dunes or beach flanking this pool. At about 2:45pm, I rejoined Julie and Tahia at the car. 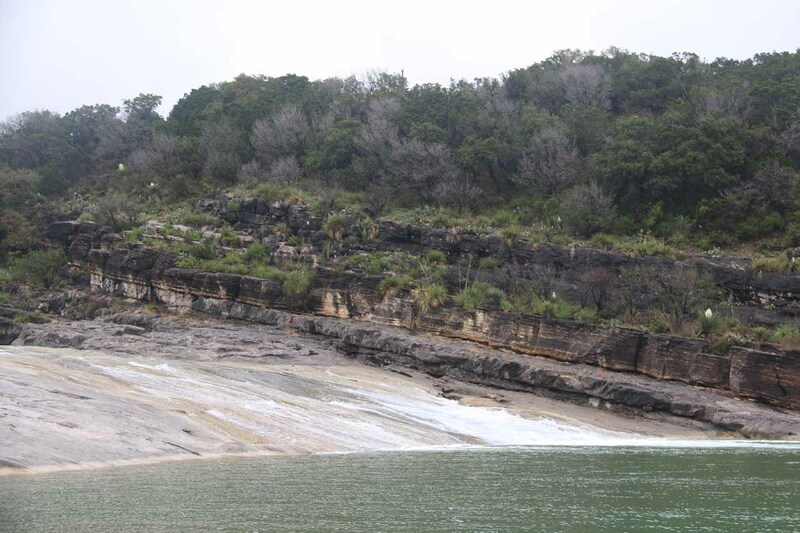 Even though I had seen people around the uppermost Pedernales Falls, I decided not to do the slippery slope scramble all the way up there from the main waterslides that we were at earlier. 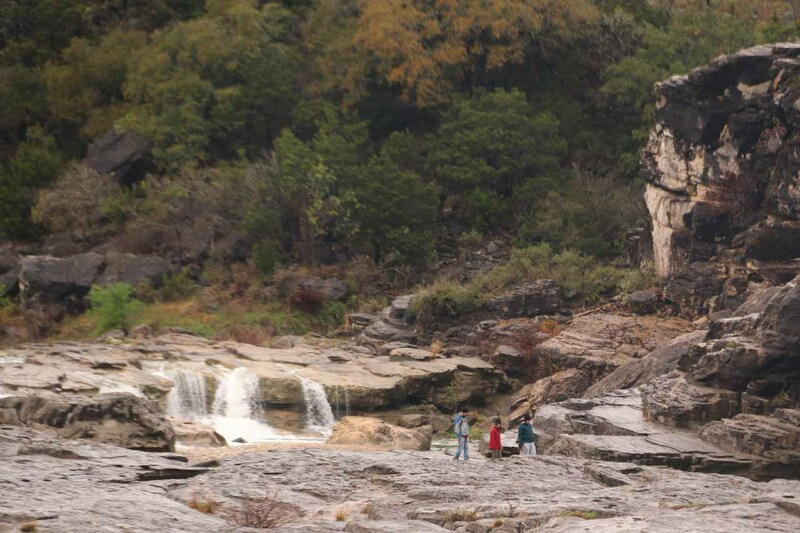 Even though that uppermost tier looked like the most vertical part of the Pedernales Falls, it also wasn’t very tall so I figured I wouldn’t regret not making this scramble. 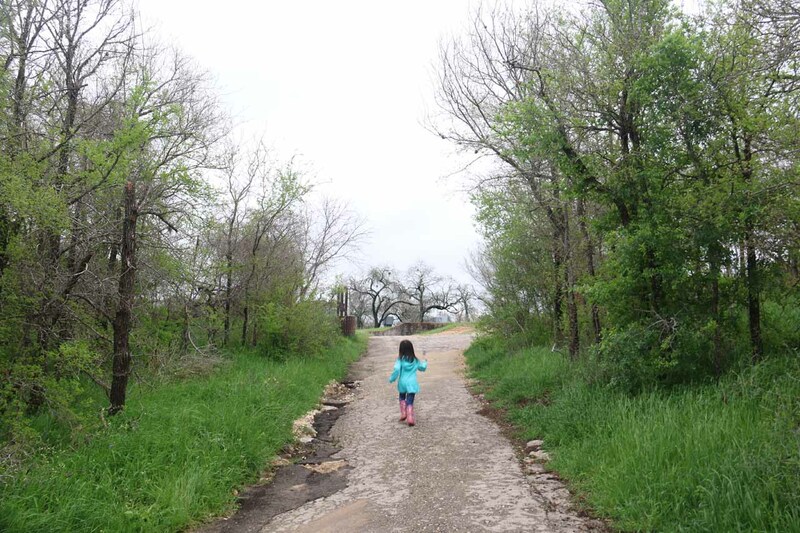 And so we headed back to Austin. Along the way at 2:55pm, we made a brief stop near the park headquarters just to see what this scenic lookout nearby was about, but it was merely a flat view over a bunch of rocks and trees and nothing terribly special. 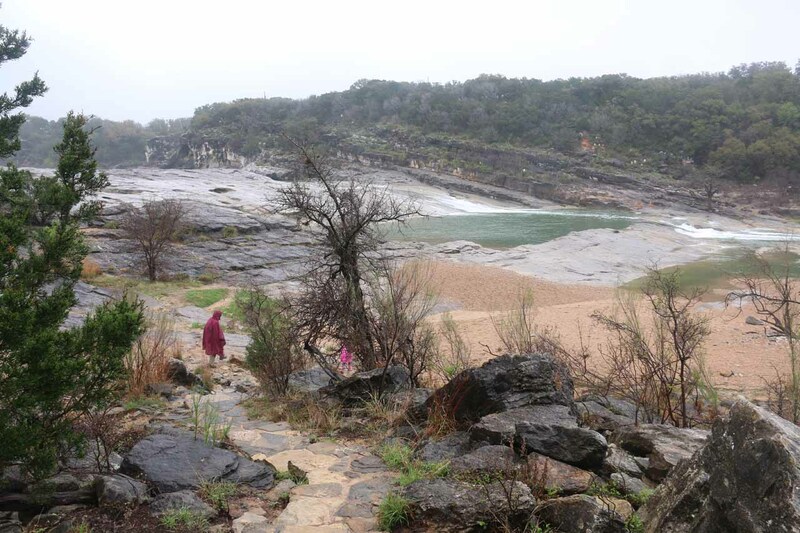 The weather was actually surprisingly calm during most of our visit to Pedernales Falls, but as we were driving back to Austin, the rain was increasing again. Anyways, we’d ultimately get to Whole Foods at about 3:55pm. Julie was very much looking forward to shopping here since she was a fan of the supermarket chain (although I tended to think of this place as “Whole Paycheck” simply because of how expensive the produce here was). So we spent some time eating a bit of a lunner at this flagship Whole Foods, and then Julie spent quite a bit of time doing some grocery shopping. So it wouldn’t be until about 5:50pm when we were finally back at the car. 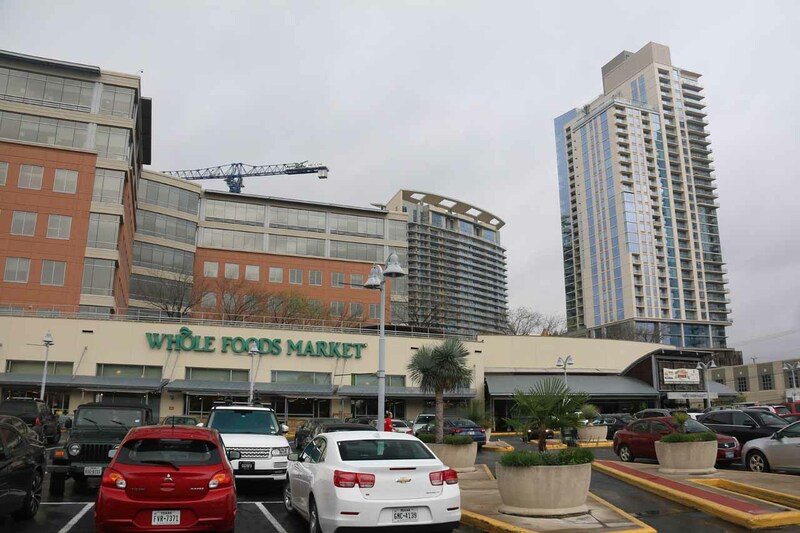 I didn’t expect to be spending two hours of precious vacation time shopping at Whole Foods, and so our hopes of seeing the Congress Ave bat migration as well as checking out any of the Austin downtown scene was pretty much down the drain. That said, Julie seemed to be in no hurry as she was genuinely excited about shopping here. I guess this was one reason why men are from Mars and women are from Venus, because while Julie was happily shopping, I was pretty much watching Tahia draw for most of these two hours. 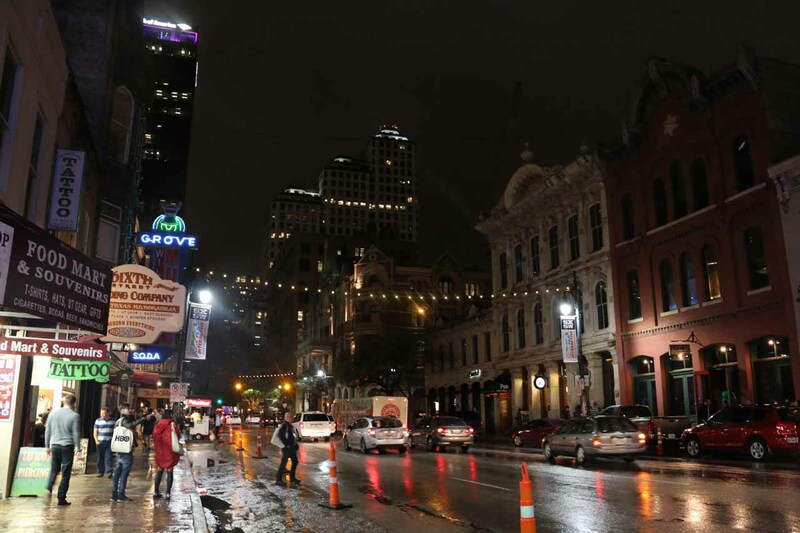 So I guess it was going to be all or nothing to check out the Austin scene tomorrow given that Obama would be at SXSW. Clearly, there’d be no way we’d want to be driving in the resulting mess. 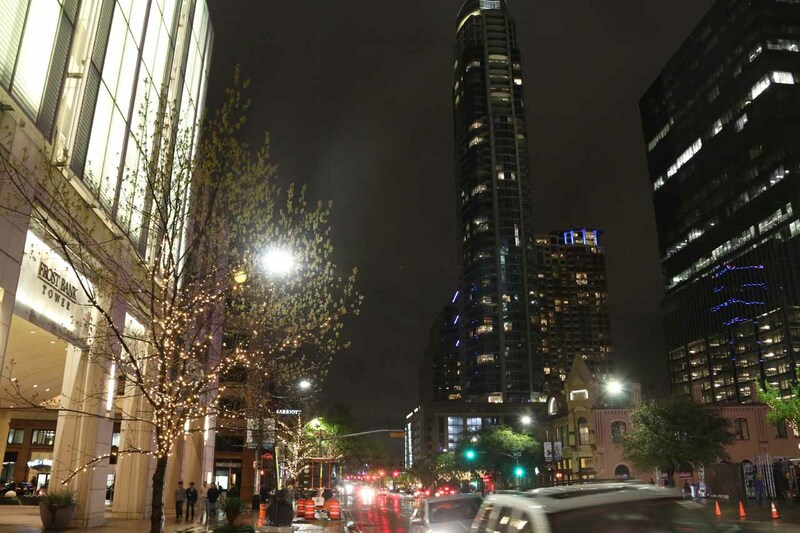 But even as we were leaving Whole Foods, it was very crowded in the downtown area as we suspected that it must’ve been Austin’s rush hour. 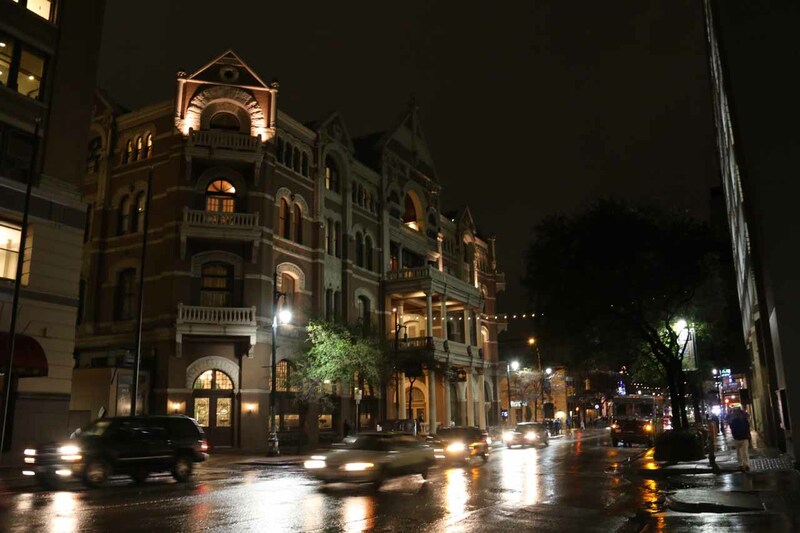 So it took a while just to drive back to the Hyatt Place in downtown Austin. That said, we made an attempt to see if we could park overnight at a different lot than the expensive valet at the Hyatt Place. 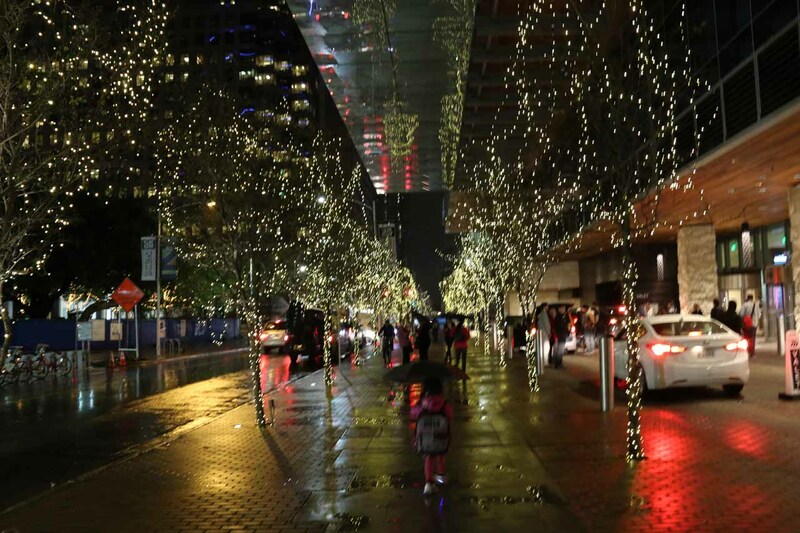 But when we saw that just about all the public parking was not for overnight parking and it was more for event parking for SXSW, we eventually returned to the Hyatt Place valet at 6:15pm. 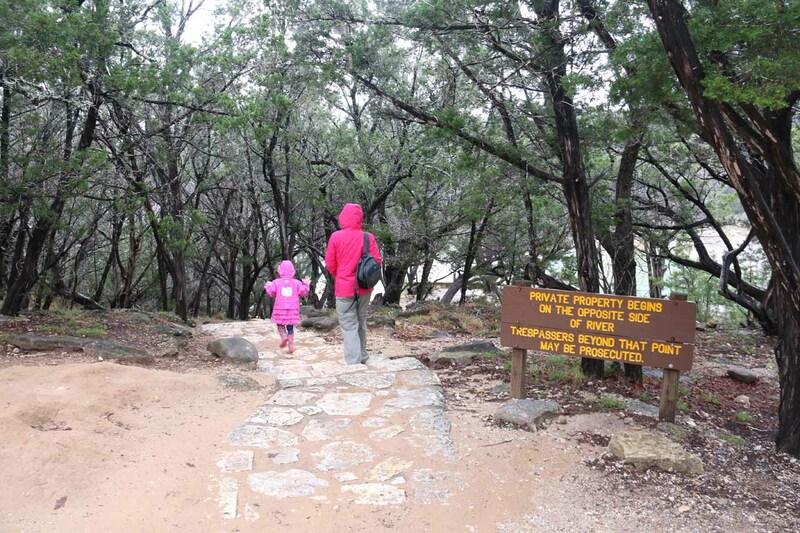 Next, we got changed into street clothes, but it still took quite some time to even get back down into Austin. 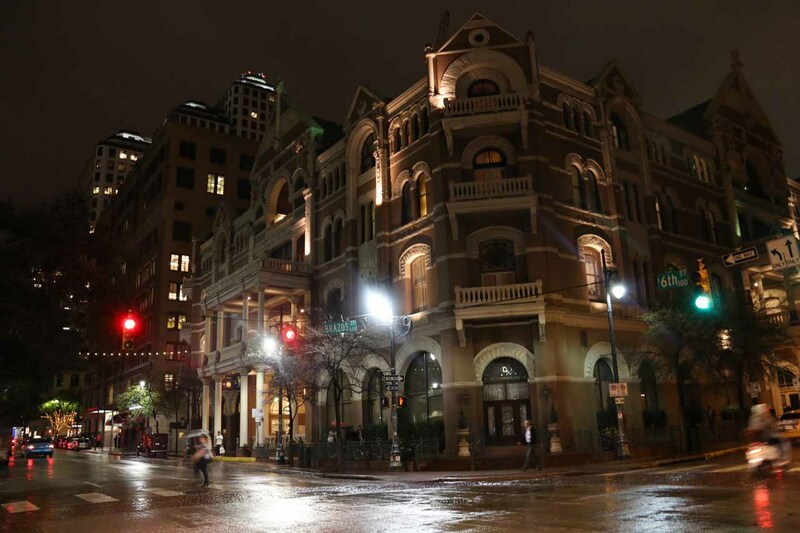 So once again, the battle of wills was mostly Julie’s will winning out, and it wouldn’t be until 7:10pm when we finally left our hotel room and went downstairs to try to experience downtown Austin. 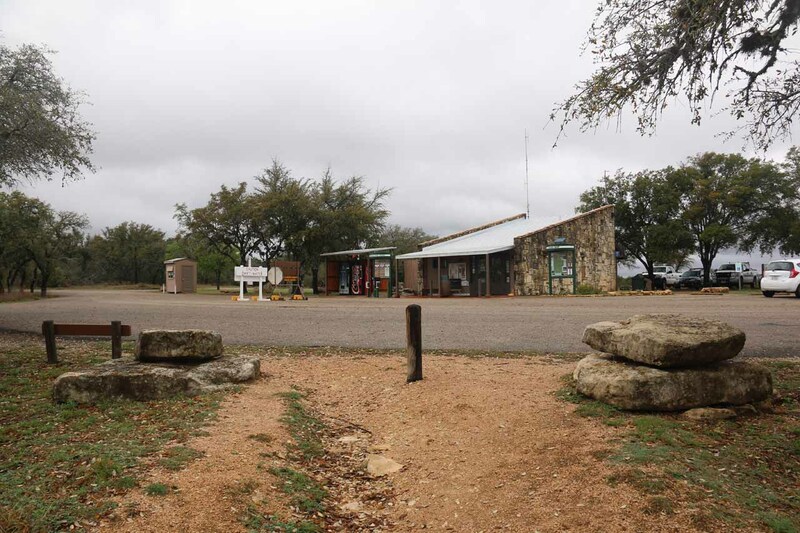 But before we did that, we stopped by this Texas BBQ joint called Coopers, which was a reception recommendation given that La BBQ and Franklins tended to have long waits and might even run out of the good stuff if not there early enough. We wound up eating at Cooper’s at about 7:30pm. 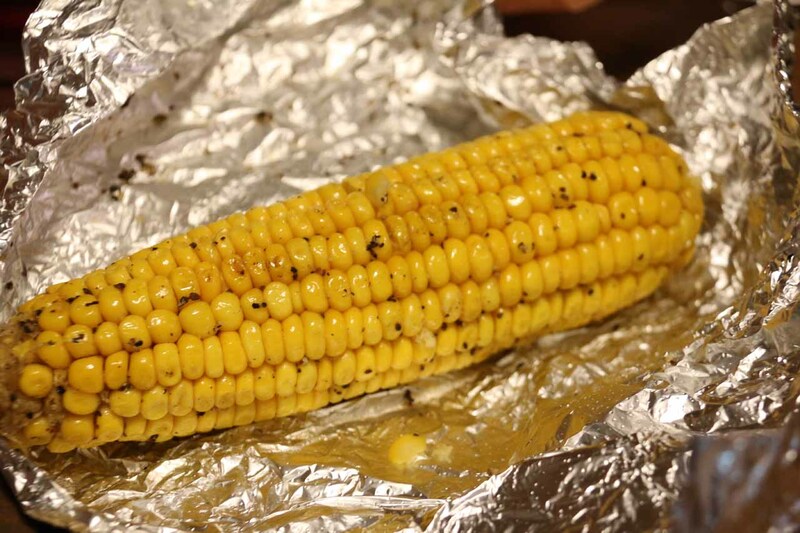 It was mostly drizzle and light rain on the way to Cooper’s, but as we were eating the briskets, corn, and chili, we could see that it was pouring rain outside. I guess it was a good thing that we were indoors having our second dinner before we’d have to head outside. 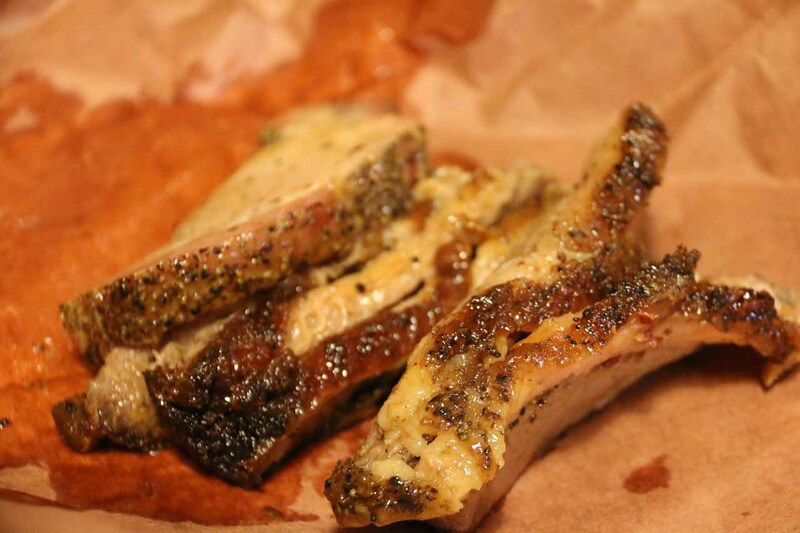 So this would be our first Austin BBQ brisket fix, which didn’t seem extraordinary. 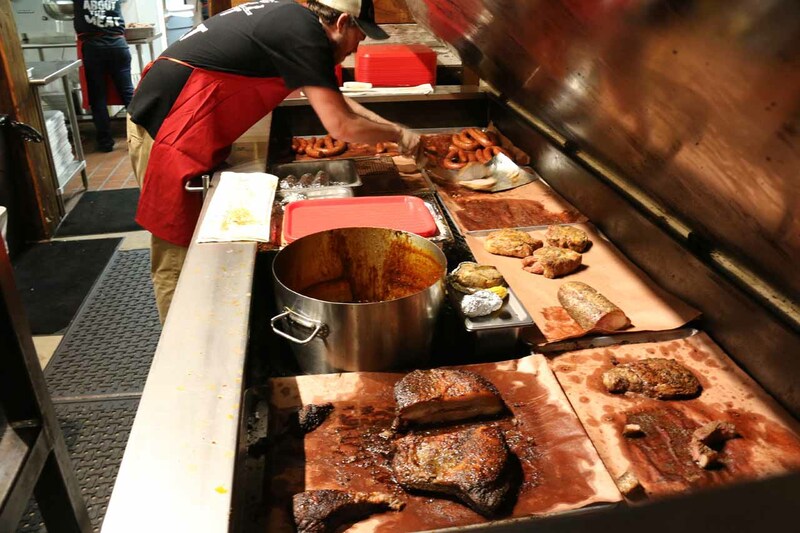 In fact, Julie once bought Texas BBQ brisket from Whole Foods back at home one time, and that some seemed more moist and tastier (albeit with a few more burnt parts) than Cooper’s. 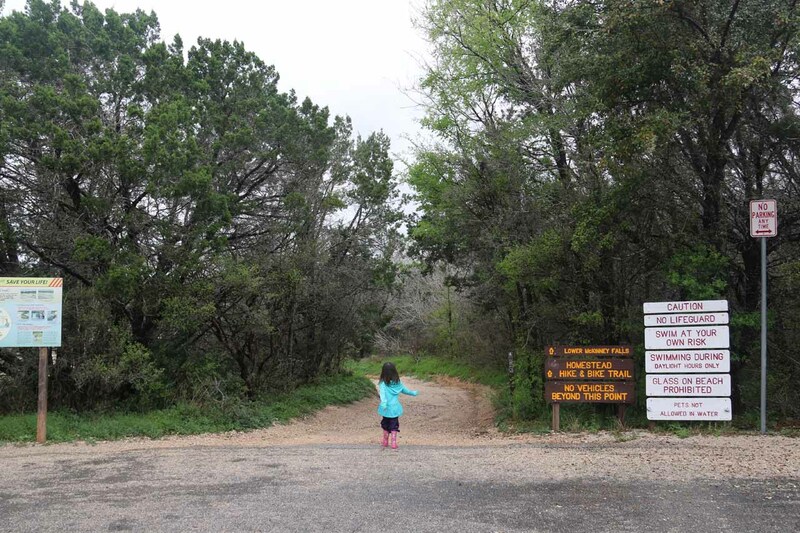 I somehow had the feeling that we would wind up trying at least La BBQ on Saturday after Hamilton Pool before we’d be making the long drive to New Orleans. I’m sure the urge to experience the difference between this Cooper’s place and La BBQ would be strong. 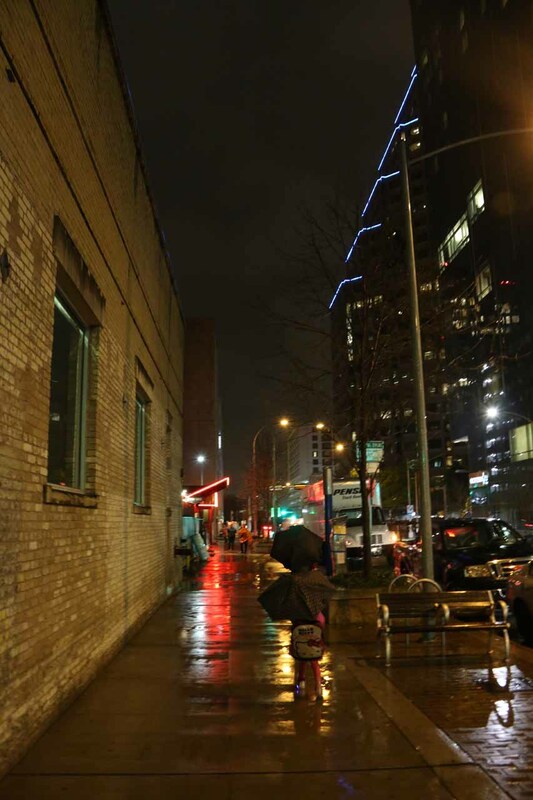 Once we were done with the brisket meal, the rain seemed to have subsided and the conditions seemed to be ripe to at least check out 6th street just to see what the hype was all about. But now Tahia was complaining that she wanted to go back to the room as she was tired (she did skip her afternoon nap today) so we split up. 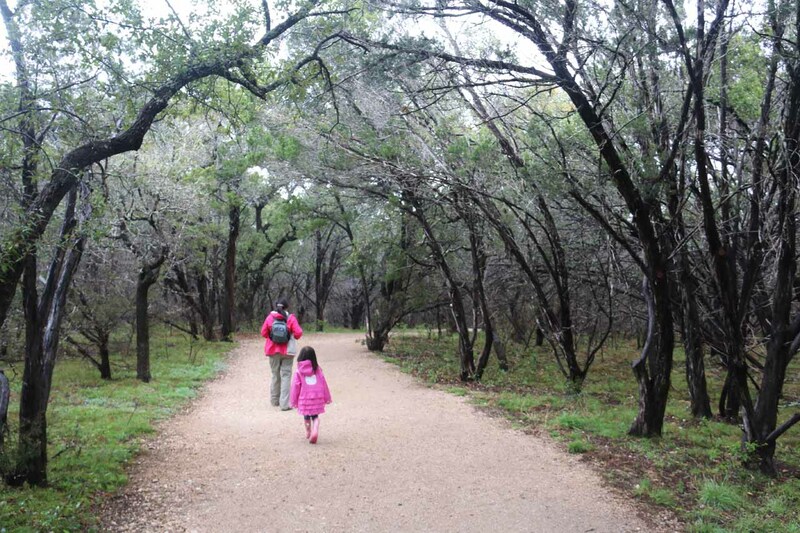 Julie took Tahia back to the room, while I explored downtown Austin for a bit on my own. 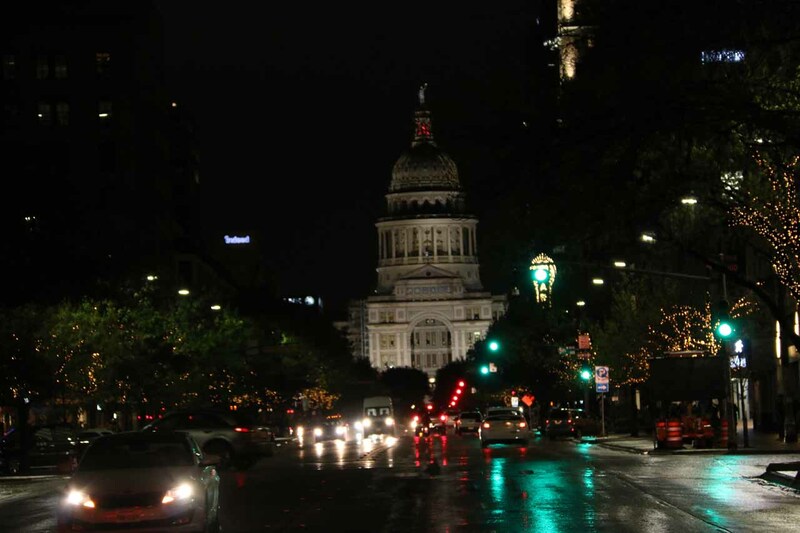 I was walking up Congress Ave in view of the State Capitol Building (apparently many other folks were out for a night on the town at this time), but eventually, I left the street for 6th street. 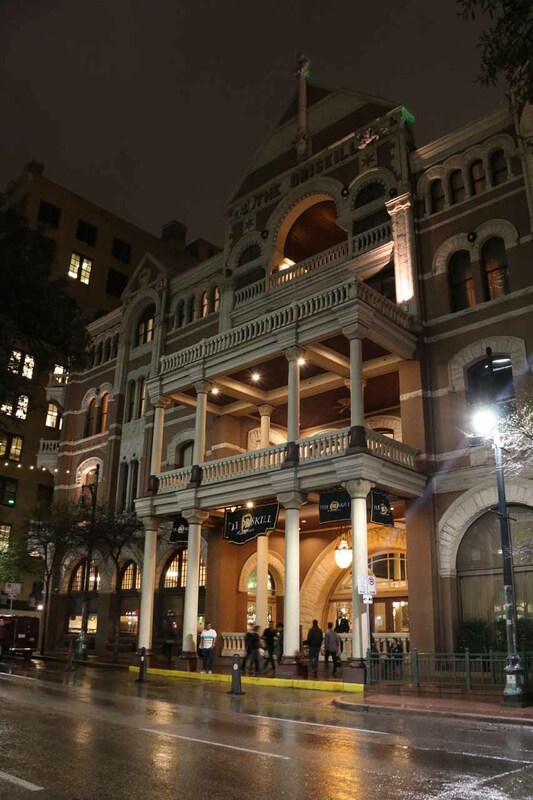 That was when I noticed there was a historical-looking building, and when I looked closer, I could see that it was the famous Driskill. 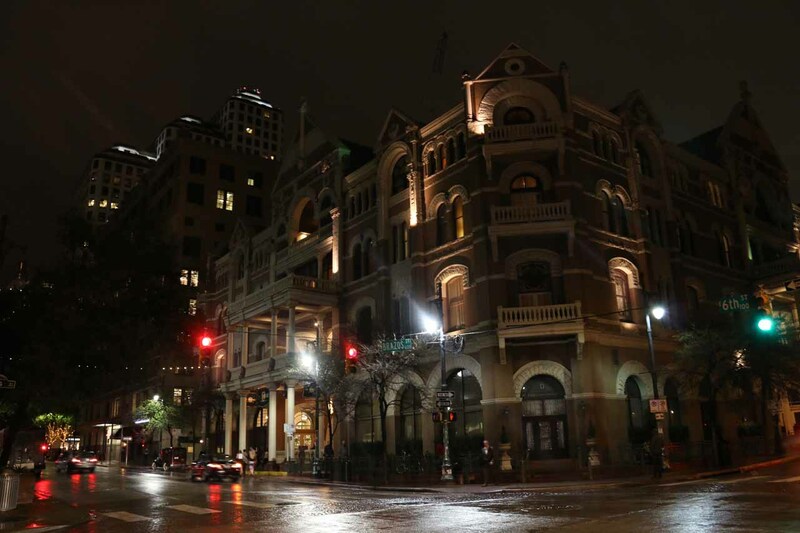 Then, just a bit further to the east of the Driskill, I saw that there were a bunch of neon signs and lots of loud live music blaring from many of the bars that were lined up along 6th street. 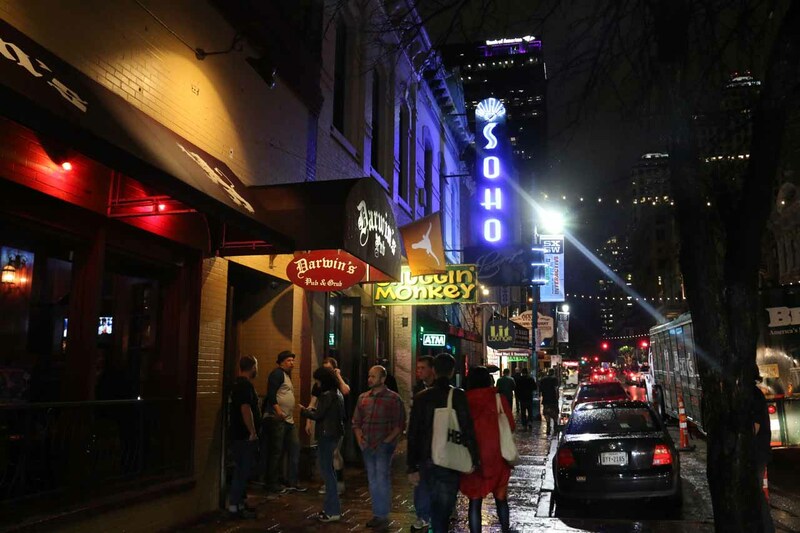 As I was strolling around this area peering into some of the bars (where some live bands were playing to pretty empty bars while others had audiences rocking), I was reminded of how this was very similar to Nashville. However, the experience here seemed to have more of a rock flavor to it while the Nashville experience was more blue grass and country. The rain was a mix of light and moderate in intensity, but it didn’t take long before I returned to our hotel room by about 8:45pm. 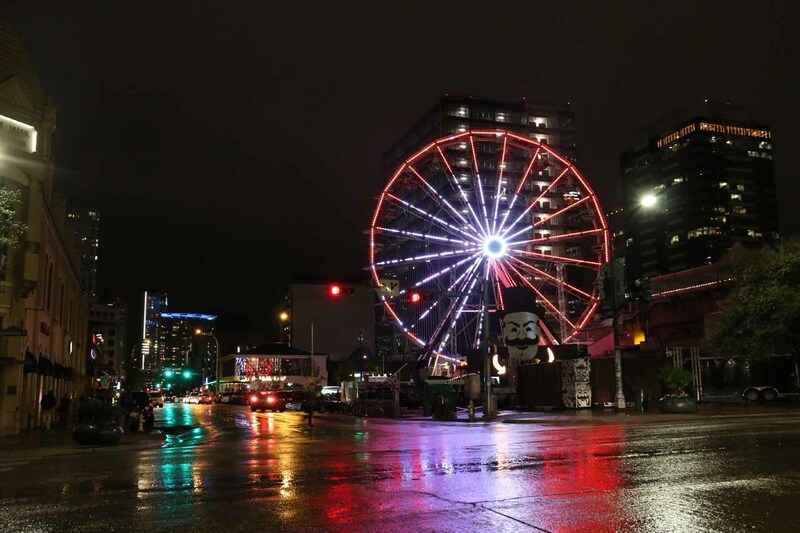 I guess touring the night scene in this part of Austin wasn’t the same when going it alone as opposed to sharing the experience with family.